Twelve U.S. journalists were participating in the Germany summer program. 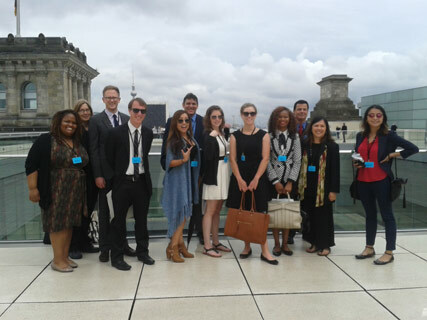 They spent the first week in Berlin for talks on current political, economic and media issues. In the second week they traveled to Erfurt, the capital of the German state of Thuringia, to Cologne with visits of Germany’s biggest public and private stations WDR and RTL, and finally to Brussels for talks with the European Commission and with NATO. Individual extension program for three participants. It was muscle memory that prompted me to turn on my cellphone after making the long journey from San Francisco to Berlin. It’s a habit I perform anytime I fly. As soon as the wheels hit the tarmac, I catch a signal and check up on my little patch of the virtual world. This time: 65 new work emails and five personal ones. Seventeen Twitter notifications. 34 likes on that Instagram photo. A missed call from my college friend. As I crouched over my phone in the tiny airplane seat, I started to feel that usual rush that comes from each little notification. That feeling of being connected, and somehow important. But, wait. I didn’t fly this far only to keep my mind tethered to my life back at home. “This experience is about international relations,” I told myself. “It’s about history. It’s about Germany. It’s about things far, far away from the Bay Area news that I’m steeped in everyday.” I turned my phone off and tucked it away as I waited in line at the German passport check. For the next two weeks of the fellowship, I vowed, I would leave my corner of the world behind and focus solely on Germany. As soon as the program started, the lessons came fast and furious. Day one was partially spent at a refugee shelter, where we met several Syrians. They’d made a harrowing journey across the Mediterranean Sea in a small boat, and that was only the first step in an elaborate trek. The voyage is dangerous and has cost many their fortunes, if not their lives. But still the risk is worth it, the refugees told me, if it means fleeing the violence and persecution they might face in Syria. Each refugee had a powerful story, but the more I heard from them, the more I was transported back home. Their stories reminded me of those we’ve heard in California, especially during 2014, when thousands of women and children were fleeing extreme violence and gangs in Central America. Many found their way to relatives living in the Bay Area and have been struggling to legitimize their place in our community ever since. They too made long and dangerous journeys. Some entrusted their lives to shady characters, while others risked their freedom by making themselves known to authorities. Though they did not flee war in the same sense as the Syrians I spoke with, they too felt backed into a corner so dark and dangerous that it was worth risking their lives to get out of it. Another takeaway came together for me as Germans I met would continually ask a singular question, “Why are so many Americans supporting Donald Trump?” The full answer to that question is complicated and befuddling — but I found that the more I talked about it and learned about European politics, the more I began to see the parallels. The concerns of the far-right groups that have gained momentum across Europe and the U.S. are at their core a reaction to an increasingly globalized world. In Germany, we spoke often of the Alternative for Germany party, or AfD, which is expected to have an increasing presence in the Bundestag if current projections hold up. They, like Trump supporters, look to restore a national culture that predates the influx of immigrants. They want work for native-born citizens. They see terrorism as a side-effect of diversity and hope to find stability by creating a more homogenous society. Considering these political movements across cultures has helped me to better understand where the anger and frustration that is fueling the Trump campaign is coming from. I suspect this broadened perspective will be useful for time to come, as these concerns are unlikely to go away with one election cycle. Those were the two takeaways that have stuck with me the most, though there are many others, like the lingering cultural effects of WWII and the Cold War, the aggressive strides Germany has made toward green energy, the great responsibility many German people feel toward the European Union, the unique funding model for public media and the importance of German-American relations for stability in both countries. 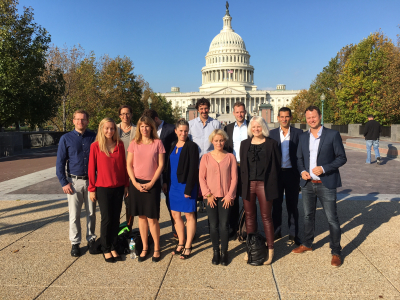 The RIAS Germany-American Exchange program was like a college-level course crammed into two fulfilling, challenging and inspiring weeks. 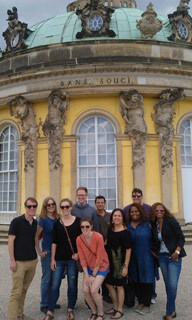 In the month since the program ended, I’ve seen the experience I had in Germany bubble up rather often. One example came moments after learning of the mall shooting in Munich. I recalled how Dr. Karl-Heinz Kamp, president of German Federal Academy for Security answered the question, “Why hasn’t there been a major terrorist attack in Germany?” In essence, his response was, “We’ve been lucky.” In a way, I’d been holding my breath since I heard that, hoping that Germany’s good fortune might continue. Alas, mass shootings became one more parallel thing happening in Germany and America. As I waited to board my plane in the Brussels airport, I dug around in my backpack and fished out my cell phone. Turning it back on, I was hit with an onslaught of dings, flashing notifications and calendar alerts. Though I had been successful keeping my eyes off my e-mail account and my time on social media sites to a minimum — I found the RIAS program was not the break from the news back home I thought it would be when I first landed. Instead, the program helped me to knit together a new layer of context I can use when examining my local community, my state and my country. By taking a step back and spending two weeks looking at the bigger picture, I feel like I gained a more acute vision of the local and regional news stories that I cover on a daily basis. Thank you. Danke. This experience was incredible and I will not soon forget it. “I can not give an answer in one sentence, only a wrong one.” The former coordinator of German-U.S. relations, Karsten D. Voigt, said this when asked his thoughts on numerous events in Germany’s history. It also helps sum up how I feel about my time with the RIAS fellowship. I can not explain in one essay how much I learned and experienced during this program. 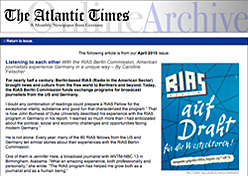 The RIAS program is so much more than an introduction into German Journalism. This is a well-oiled immersion machine inside European history, politics and world relations. All of it brought together through the vehicle of journalism. After completing the RIAS fellowship, I believe Germany is the perfect host for such a program because of how seamlessly it intertwines its history into its present and future. Germany is a country alive with history. When I first arrived, I began researching museums but quickly realized that Berlin is one big outdoor museum. Around almost every turn, you can see remnants, reminders and memorials to World War II and the Cold War. Germany does not hide away the atrocities of its past, instead they are out in the open as daily reminders so that the past is not forgotten or repeated again. It is one of the things that fascinated me most about the country. America treats its troubled past very differently. The U.S. tends to hide away our mistakes and this has created a great divide in people. 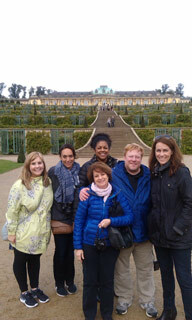 RIAS began our immersion into Germany very quickly. On our first day we were taken to a refugee shelter and spoke with some of the people who live and work there. The Syrian refugee crisis is one of the biggest issues that Germany, and Europe, is facing right now. I see the images everyday on CNN, but sitting down and talking to people who are living through the situation was eye-opening. One man had to leave his wife behind, another was a doctor who escaped by fleeing through the woods. Hearing their stories made you appreciate how much Germany has done to help those in need. The country has not only opened their doors to those fleeing but also provides assistance with language classes and job training. The refugee debate was a major component of our program. We spoke with council members in charge of helping refugees integrate into German life, the executive director of the Cologne Institute for Economic Research about their impact on the German labor market and several German journalists about how the story is being covered. We heard from people on both sides of the story and experts with a wide range of opinions. The only thing we spoke about more during our two weeks was Trump. Based on my Facebook feed, if Trump wins the election Germany might have an American refugee crisis this time next year. We spent most of the days with journalists and experts speaking about European politics and learning how the media in Germany operates. Most of our nights, however, were spent getting to know the rest of our fellows. Our fellowship consisted of journalists from all over the states, working in television and radio. Each night we would meet-up to trade stories and tips over long European dinners. Our fellowship was split with about half of us working in television and the other half in radio. Since most of my colleagues work in tv, it was nice to spend time around radio journalists. A lot of their experiences about pitching ideas, producing stories and exploring new storytelling options could be applied to my work in television as well. I came home with a lot of new ideas and tricks thanks to our fellowship. Our fellowship was very strong and a lot of that had to do with our leadership. Rainer acted as our Gandalf, introducing us to interesting people from all over Germany and leading us from town to town. Isabell and Lisa were our Frodo and Samwise, leading us when Rainer wasn’t available and helping us transverse new territory. One of my favorite activities during the two week program was the “Blind Date.” RIAS set each one of us up with a German journalist who took us to one of their favorite local spots. I was paired up with a Documentary Producer / Director who took me to her favorite biergarten. It was great getting to hear production stories from someone with a job similar to mine over beer and schnitzel. We compared stories about the differences in how German and American media work. She works a lot on in-depth, longer form hard news, while my focus is on shorter, sponsored feature-type material. I learned that you can’t even have an ad during most news programs in Germany. If you tried to put a sponsored piece in a German news segment, they would probably revoke your license. It was very interesting seeing how different Germans and Americans are with their news. In Germany, the nightly news is one of the country’s top rated programs. It consists mainly of an anchor reading the news and sounds like it doesn’t contain the flash and “entertainment” that has been peppered into U.S. news. Overall, Germans seem to be much more serious about their news, politics and the issues facing their country and Europe. Everyone I spoke with had very informed opinions of the refugee crisis, the Brexit / EU situation and how Germany is seen throughout the rest of the world. Everyone is also very aware of what is happening in America. We spoke about the upcoming Presidential election in almost every one of our meetings and people are very concerned about how the outcome of our vote will affect the whole world. I wish more American citizens were as concerned and informed as Germans are about serious issues like this. We might not have a reality TV star as a presidential candidate if so. Speaking of Brexit, after our time in Germany, we spent three days in Brussels right when the UK was voting on whether to leave the EU or not. Most of the people we met with were hoping that the UK would vote to stay in the EU because it would help keep up the strength of the Union. I think that Dr. Karl-Heinz Kamp, president of the Federal Academy for Security, had the best reaction when he said, “If they vote to leave on Friday morning, I won’t lose any sleep later that night.” I wish I could say the same about the upcoming U.S. election. Brussels was one of my favorite parts of the fellowship. Besides touring and meeting officials at the EU, we also toured NATO and Germany’s ARD television bureau. This was one of the most rewarding and enriching professional experiences that I have ever had. The people I met at RIAS and through the fellowship feel like a second family. Rainer, Isabell and Lisa did an incredible job scheduling and leading the program. Their love for Germany came across in almost everything we did in the program. That love definitely rubbed off on me and I’m sure it did for my colleagues as well. Even though most days were packed from beginning to end, the fellows and I still found time to eat plenty of currywurst, pork knuckles, visit a few biergartens and experience the Berlin techno scene. I know that EU President Jean-Claude Juncker said that he didn’t want any “Part Time Europeans” in regard to the Brexit vote, but after this experience, I would like to consider myself a “Part Time European.” It is a badge I will wear with honor. 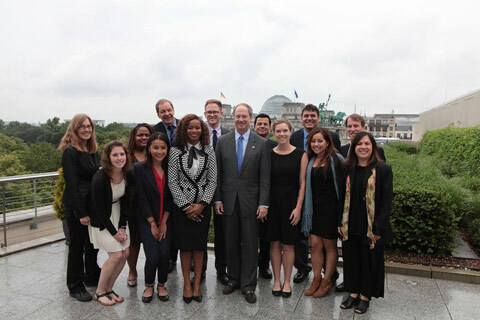 Every journalist working in the United States needs to experience the RIAS Berlin Commission Fellowship. Their participation would benefit journalism, democracy, and world peace. The experience provided me with a broad, timely understanding of Germany’s politics, economics, and broadcasting, placed in a historical context. The history is relevant for Europe and the United States. Hearing from and asking questions of experts, researchers, politicians, and journalists, combined with visiting historic sites, provided me with new views and new questions about U.S. participation in the world. At the time, the Brexit vote was looming. Subsequent news coverage of the outcome took on new meaning based on lectures at the European Union (EU) headquarters. Others explained to us the value of having a united European view in furthering world stability. That seems particularly valuable as the United States begins a presidential campaign. The people who planned our visit, Rainer Hasters, Isabell Hofmann, and Lisa Ziss, focused part of our itinerary on the refugee story. Germany, a country of 80 million people, has taken in more than 1 million refugees in about 16 months. Visiting refugee centers, talking with refugees in Berlin and Erfurt, and meeting the people who are helping refugees was fascinating and uplifting. The refugees we talked with were eager to be integrated into German society and supported a process requiring refugees to learn to speak the German language. A researcher explained current thinking about how to integrate refugees. We heard from politicians and journalists about the ways in which the admission of so many refugees might affect German politics. In addition to their many kindnesses, the critical contribution of each of our hosts was their individual perspectives and abilities to provide additional context to what the experts were explaining. Nearly daily, in conversations among ourselves, we would wonder aloud what one of them would think about our discussion. Daily their comments enriched the experience in a way that was only possible because they had been raised and educated in Germany. We learned about the terrorist threat in Germany from Thomas Volk of the Konrad-Adenauer-Stiftung. He described the range of the threat of terrorism in Germany and offered a compelling agenda for countering that threat. Every fellow was impressed by his content and delivery. He provided us with a useful paper handout. Others explained the potential threats from other states. 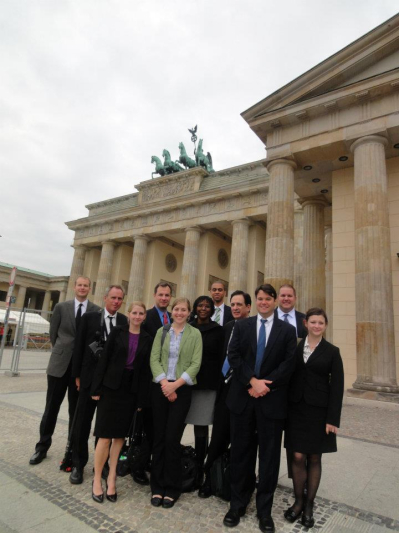 We heard from a German official with security responsibilities and had briefings from NATO and EU officials. Those briefings gave me a visceral appreciation for the way in which the U.S. geographic isolation from military threat has formed public views, and of the vital importance of the NATO alliance. Following a career as a broadcast journalist and training as a historian, today I teach broadcast journalists. My increased understanding of politics, economics, and journalism in Germany and Europe will directly benefit my journalism students, many of whom are descendants of German immigrants to the United States. The trips to historical sites were particularly moving. Standing in the room in Potsdam where Winston Churchill (replaced by Clement Attlee) Harry Truman, and Joseph Stalin met to negotiate the terms of the end of World War II was as inspiring as it was horrifying to visit the rooms at Wannsee Villa where the bureaucratic details of the final solution were worked out by Nazi leaders. Everywhere there were descriptions of what happened leading up to and during World War II. A bombed church has been preserved near a busy shopping area, and a historical marker near a lovely park explains that a facility on the location was used during the killing of mentally ill people. Nothing could have prepared anyone for the chilling visit to the Stasi prison operated in East Berlin from 1945 through 1989. Many of us had seen the movie “Other People’s Lives” before the visit. It provided some context, but the additional details of torture described by our guide, and seeing the tiny, windowless cells, were as heart-wrenching and disturbing as the visit to the site of a former Nazi concentration camp. Experts at the Buchenwald Memorial emphasized a recent turn in the accepted historical narrative of Nazi Germany. Our guide explained that historians now believe that all German citizens knew about the camps and knew what was going on in them. Buchenwald was near the town of Weimar, home to Germany’s first democracy and, earlier, Johann Wolfgang Goethe and Friedrich Schiller. My experience as a RIAS Fellow is incomparable. I was fortunate to be invited to attend the RIAS Commission Awards, and I am grateful to have shared the experiences with commercial and public, local and network, television and radio journalists from across the United States. It’s impossible to overstate my appreciation for our hosts, Rainer, Isabell, and Lisa, and to the Berlin Commission members for making it possible. I have been to Europe annually for the last twenty years and I thought I knew it well. I had even spent a week in Berlin in 2004. But this fellowship opened my eyes. It was the most culturally enriching experience I have had on the continent. It was a true learning experience to see a country through the eyes of its natives and some American ex-pats. I have broken down the fellowship into four topics, as I saw them. I will explore each one and offer my assessment. We hit the ground running on this topic. We received a skillful and informed orientation over breakfast at our hotel. Part of this included an outline of what to expect in Berlin, in Germany and beyond to Belgium. Our visit to the Reichstag/Bundestag outlined the importance of symbolism in Germany. The building is dedicated to the German people and serves as a tribute to democracy. Great pride is taken in the fact that the Nazi regime never used the building as a seat of government. Metal boxes are dedicated to every member of parliament who was democratically elected. Even the Bundestag is democratic in its very nature — 630 seats or constituencies. That’s roughly one representative for every 128,000 Germans. The U.S. House of Representative has 435 members — one per 733,000 Americans. The building is also dedicated to the transparency of government. The dome of the Reichstag is glass and looks out onto the city. A giant cone of mirrors reflects from the dome down into the Bundestag. You can see lawmakers at work, while light is reflected into the chamber. There was a refreshing look at Germany’s past, complete with all of the blemishes and scars. This included our incredible day south of the city center. It was chilling to visit the Wannsee Villa. Such a beautiful summer home was once occupied with an evil intent. You cannot help but get goose bumps as you stand in the very room where Hitler’s “Final Solution” was outlined. The documents from that meeting are now clearly laid out and there for everyone to see. When you look through the room’s huge windows, you can’t help but wonder what was going through the minds of Hitler’s ministers as they peered out onto the gorgeous view of the lake. In nearby Potsdam — a contrast of periods. There is the Cecilienhof Palace. It was once the stately home of a German prince and his wife. It was also the site of the Potsdam Conference, which decided the fate of Germany after World War II. Yes, that conference guaranteed three generations of peace for Western Europe. But, it also divided Europe between freedom and oppression, prosperity and struggle. Not far away — the massive and fanciful Sansouci, a palace of “no worries.” This former “getaway” home of Frederick the Great is truly a German Versailles. It conjures up the greatness of an era of royalty and emperors and reminds us that Prussia was once a powerful player on the world stage. We were able to witness some of Germany’s more troubled, recent history. The trip to Buchenwald was not my first visit to a Nazi era concentration camp. I went to Sachsenhausen during my first trip to Berlin. In fact, I found my visit to the latter to be more emotional and disturbing. Much more remains of the Sachsenhausen camp and the giant gates are still adorned with the infamous expression, “Arbeit Mach Frei.” But, the massive crematory ovens at Buchenwald were wrenchingly impressive. They are symbols of the cold production line efficiency of the Final Solution. Hohenschonhausen was equally troubling. You would think that the horrors of the Nazi era would not be repeated. Instead, the methods of torture were updated and made more intense by the communist East Germans. Prisoners were forced into isolation, starved of daylight and deprived of sleep. Some were subjected to a bombardment of radiation so that they would slowly die of cancer. This is a reminder of the cruelty of the Soviet era. The RIAS Awards night was a surprising cultural experience. We were able to speak freely with so many of the people we had already met, including the Deputy Chief of Mission at the U.S. Embassy, Kent Logsdon. I was most impressed by the awards themselves. 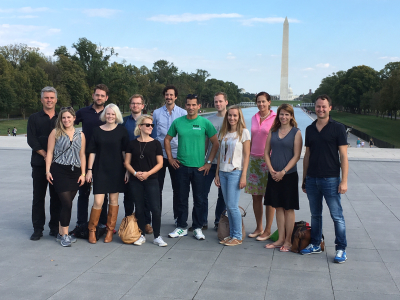 It was interesting to see the U.S. through the eyes of German journalists. They seemed particularly interested in America’s crime, lingering poverty and strained race relations. It was also interesting to see Germany through the eyes of a staunch American. U.S. Ambassador John Emerson gave us a frank assessment of German-American relations and its strategic importance. It was so nice that he extended his talk with us beyond the time limit. Everyone was clearly enjoying the depth of the conversation. Karsten Voight was nearly the flip-side of that experience. As a veteran of the German Foreign Office, he drove home the importance of American-German cooperation. He offers an interesting perspective on Germany’s emergence as a key partner with the U.S.
Dr. Mario Voigt was particularly upbeat. He painted a picture of a prosperous Germany, especially in his native state of Thuringia. He told us employment was high in this former East German sector. He also talked about an uncertain future with the Brexit challenge, the refugee crisis and the rising tide of nationalism. As an aside, the Thuringian capital of Erfurt and the historic city of Weimar were complete gems. Erfurt offered the wonderfully preserved Merchant’s Bridge. Its cathedral is majestic, even at night when we climbed all of the stairs. Weimar’s place in history cannot be underplayed. It served as the birthplace of a democratic period in Germany that lasted between two wars. The city also pays homage to the German Enlightenment and the Bauhaus art school. Cologne’s Cathedral is massive. It rises impressively along the Rhine and serves as the city’s focal point. It speaks to Cologne’s place in world history, while helping the city’s citizens maintain their link to the past. These two topics seem inexorably connected, especially in the aftermath of the recent terror attacks in Bavaria. We received very frank assessments from Dr. Karl Heinz- Kamp, Thomas Volk, and Dr. Hans-Peter Klos. All of our German presenters drove home the importance of their country’s commitment to welcoming refugees. It is something that goes to the very core of the republic. But, they also realize that Germany leaves itself open to a real threat. ISIS can easily exploit a nation’s benevolence for its destructive intent (and, in fact, ISIS has done that). The challenges for Germany are many-fold. First, the refugees must be carefully vetted. Those with a criminal intent must be weeded out from those who are truly seeking security and an opportunity to live their lives freely. Secondly, Germany must quickly integrate these people into a free society while allowing them to maintain their unique cultures and identity. Then, Germany must offer training to bring these people into the job market. A failure to do all three of these tasks will foster despair among the refugees and can ultimately allow the ranks of terrorists to grow. I took issue with one speaker. He seemed to imply that Germany sees these refugees are a source of unskilled, cheap labor. “We have a shortage of hairdressers,” we were told. This outlook ran counter to what we found when we visited the refugee camps. Many of the Syrians were well-educated with professional degrees. It is my hope that Germany will allow these refugees to reach their true potential within the job market. Anything short of that will foster resentment within the refugee community and cause unrest. We visited with refugees in Berlin and Erfurt. It put a human face on the many stories we have heard—the struggle to reach Germany and the fears of remaining within Syria. I was truly impressed with the refugees we met. I would be honored to have any of them as neighbors in the United States. They were smart, educated, eager, and motivated (also surprisingly westernized). You could see they were fearful about the future—but also hopeful that they can become successful, while living happily and securely. 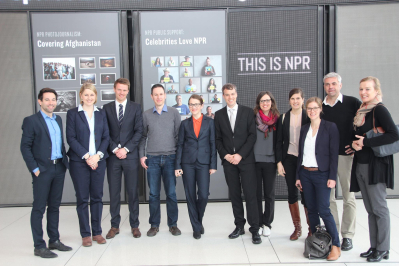 It was an honor to meet some of Germany’s most outstanding, high-profile journalists. I was impressed with their mastering of American colloquial English and their understanding of American history and culture. Thomas Walde’s insight into both U.S. and German politics put so much in perspective. He spoke openly about his experiences covering both and he gave us his honest assessment of the political scene. 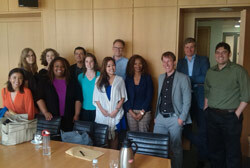 Peter Kloeppel filled us in on the structure of the news business in Germany. He worked for the powerful Bertelsmann/RTL group, while Walde was able to explain the well-financed but independent world of public broadcasting. It was interesting to see how the concerns over ratings and market share are just as alive in Germany as they are in the U.S.
We visited the fascinating Axel Springer Academy. We learned that journalists are trained much differently in Germany than they are in America. In the U.S., students go to university and obtain baccalaureate degrees in journalism, communications or a related discipline. In Germany, journalism is treated more like a trade where students are encouraged to learn by “doing” and even experimenting. It was interesting to hear from two young, eager students who have already accomplished so much as part of their training. A very special thanks to Thomas Habicht. His knowledge of German broadcasting was incredibly valuable. Erik Kirschbaum told us what it’s like to be an American expat, living and working in Germany. He made it sound so easy. But, I’m certain the challenges for American journalists working overseas and trying to earn a living as independent contractors are far more daunting. In fact, he has proudly taken up the sideline business of harvesting and promoting solar energy. At first, the “Blind Date” with a German journalist seemed trepidating. I did not know what to expect. But my host, Dorte Stoermann was so welcoming. She showed me the studios of “RTL II” with its small, youth oriented news operation — much of it designed for online consumption. After dinner with one of their reporters, Dorte took me backstage to the big Euro Cup viewing party at the Brandenburg Gate. I was able to watch German journalists at work as they covered this event, while being a part of the “party,” as well. It was a wonderful cultural experience. The trip to Brussels allowed us to learn so much about two of Europe’s important institutions — NATO and the European Union. It was exciting to be inside the offices of the EU on the very day that British voters were casting their ballots on the “Brexit” plebiscite. There was a palpable sense of urgency and doubt about the outcome. It was as if I was in the center of a political maelstrom. The EU works on so many levels. It is a political forum to which each member nation sends elected representatives to determine matters of mutual interest. It is an economic union, in which nations trade freely. It is also a judicial forum, where matters of human rights can be evaluated. NATO is a far bigger organization, encompassing more nations including the U.S. Our speakers drove home the consortium nature of NATO. Its success is based on the commitment of military resources from its member nations. It can only provide for mutual protection if everyone is on board. Right now, we are at a serious juncture in American history. U.S. voters are presented with a candidate who can seriously impact the security of the NATO pact. Having learned so much about this alliance, it drives home the importance of the upcoming presidential election. I want to extend my special thanks to Rainer Hasters, Lisa Ziss, and Isabell Hoffmann. They warmly welcomed us to Berlin. They expertly guided us through the program. Most of all, they treated us as family. Our group meals were incredibly convivial, humorous, and genial. It was also a great idea to end the fellowship with a visit to Bruges. In some ways, it was sad because it marked the end of two magnificent weeks. On another level, it gave me time to reflect on the fortnight. I looked up from our boat, while riding through the canals, toward the sunshine and the beautifully preserved medieval buildings. I reflected on how small the world really is. We all share this tiny marble, spinning wildly through space. If we are to keep that world spinning with a reasonable degree of peace, safety and security; we must learn to share the planet and appreciate our mutual humanity. How do I make you feel what this wondrous, brimming experience was like for me? Before the country, the history, or the journalistic access, what made this the seminal trip it was were the people. It was a bit like summer camp — but better (and with beer). You come together with some of the most talented journalists across the U.S., and you become wide-eyed kids again, relearning how to behave in a different culture and relishing all the things you learn that you don’t know. You become close with a group of strangers, who become your breakfast dates, your shopping partners, and many times, your lifeboat in a steady sea of strangers. But you learn the most from the German hosts, the leaders of RIAS who guide (read: babysit) the group as you move from historic site to journalistic briefings to political lectures. The stories from Rainer, the then executive director, about Germany’s history as well as his own predilections and jokes gave parts of Germany a dimension no plaque or pamphlet could ever create. Isabell’s guidance and Lisa’s company were indispensable; it was like having friends show us around. So what did I learn? Well, first, it was refreshing to consider and analyze ideas at a macro level. A good chunk of Americans see no need to understand or know what’s going on with the rest of the world, often because we don’t seem to depend on the rest of the world. It is true that America leads in many ways; we spend the most on defense, and organizations like NATO rely heavily on our resources. But the more time we spent talking with German government leaders and journalists, the more apparent it became that Americans are insulated, compared to Germans. How could the average German know so much about us — our politics, our history, our cultural attitudes — and our average American, so little about them? And, as one German journalist explained/lazily dismissed, why should they? Leaders usually aren’t too concerned with those behind them. And it was with that lens that I tried to understand what living in Germany is currently like. Everyone in Germany, it seemed, had an opinion on the open door policy that Germany was showing to Syrian refugees. At more than one million refugees, Germany has taken in the most people out of any other European country. Most people we met and spoke with agreed that receiving refugees was a humanitarian imperative, that it was the morally victorious route. Much of that attitude was explained with Germany’s role in WWII, the subsequent guilt and the need to never repeat past mistakes. But, in every discussion we had, we also heard about the AFD, a rising, alternative ultra-conservative group that is vociferous about its anti-refugee stance. We heard about several incidents around Germany (one wherein signs at a local swimming pool had to be posted explaining that just because a woman was in a bikini did not mean it was a signal or encouragement for sexually assault. I asked a refugee his thoughts on this, and he explained that this was a condemnable action and that those who did violate women were bad individuals not acting according to Islam). We were also given a tour (not open to public) of a refugee camp in Berlin, which was set up in a massive balloon-like tent with no air conditioning. Men and women were separated per religious guidelines. Here and at other centers, we spoke with several refugees, heard their incredible stories of escape and felt their hope for a life better than the one they ran from. Germany is in an incredibly unique position in their country’s history — not every country has the funding to immediately support a million more people — and as they receive more refugees, the face of Germany, which a former German government official said was admittedly monochromatic — could change in a very short time. The refugee crisis is intricate and unpredictable; that Germany has decided to help in as large a scale as they have will unequivocally change their country. And that was just one topic. Over the course of two weeks, we explored the nation’s politics, security, its role in the EU and the world, the approach toward journalism there, and of course, its history. Each day of the fellowship counted. The schedule was crammed with talks, lectures, briefings, tours, train rides, and wonderful food. (Schnitzel, all-the-rage stangenspargel, bubbly beer cheaper than water, amazing mussels, street schwarmas everywhere, free breakfast every day, wonderful steak; RIAS keeps you well fed, and I wish I had brought workout clothes.) We met salty German journalists who told hilarious jokes without a trace of a smile, and we saw how drastically different the Germans are with public journalism. And then there is the history. In between talks with government officials, RIAS takes you to castles and the Bundestag so you can tie the history — always the history — to current actions. 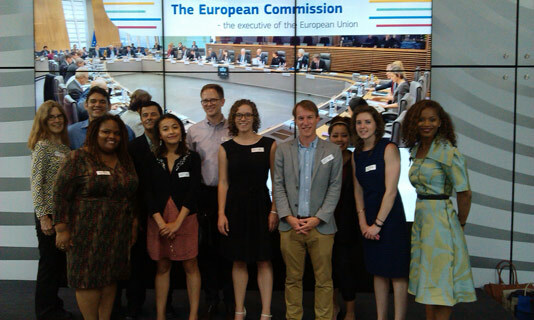 For our particular session, we were lucky enough to be there as something historical happened; the schedule coincidentally placed us at the EU headquarters in Brussels during the Brexit vote. The fellowship was revitalizing — it was unlike anything else I could even think to do for my professional growth, and even more, the fellowship was a chance to recharge. You are young again, charging on to different territory, a journalist without obligation, save a schedule created to engage you. You are there to to simply soak it all in, to learn and appreciate and to weave all you’ve learned at this point into the consciousness of a foreign city. It was perfect. Unfortunately, I didn’t learn German in two weeks. A handful of words, yes, but proficiency still alludes me. Fortunately, I learned so much about German culture, government, media and politics – much more, than I ever expected. After two weeks abroad, I returned to the states, armed with quirky souvenirs and funny stories to entertain friends and co-workers. But the toughest thing to unpack was the abundance of knowledge that I absorbed in Germany and Brussels. There’s also the realization that the world is much smaller than it appears and globalization is only shrinking it further. But let’s start unpacking, shall we. In the future, maybe 30 years from now, there will be college courses dedicated to teaching history majors about the Syrian refugee crisis. There is no better way to understand the crisis firsthand than to talk to the refugees themselves. 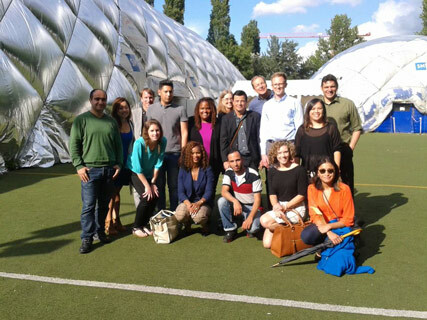 Early on during our fellowship program, we were able to do that when we visited a shelter, dubbed “the Balloon,” in Berlin. It was hot inside. This dome structure was home to dozens of families, from Afghanistan to Syria. This was one of the best refugee shelters for them, we were told. I saw a boy, maybe 6 or 7 years old, with dark circles under his eyes. He slouched to the floor and unexpectedly, began to punch the shoe of one of the RIAS journalists. He didn’t mean any harm. I am no child psychologist, but I gathered that this boy was struggling. Whatever he was feeling, he didn’t know how to express it. So he punched the shoe again and again. His slightly older brother intervened, shuffled him away and whispered in his ear. Who develops bags under their eyes at such a young age, I wondered. We met several refugees that day, mainly from Syria. Later on during the program, we also met two other young men who had settled in Erfurt. Their stories were all similar – “I wasn’t afraid of ISIS as much as I was afraid of Assad’s government.” Their journeys from Syria to Germany all sounded like traumatic odysseys. They were grateful to the German government. They had dealt with prejudice on some level. They were all hopeful. In short, after hearing the stories from multiple refugees, I began to wonder about that little boy again — who knows what he had to experience to get to Germany? Who knows how long and arduous that trip had to be? And to think, he’s one of the lucky ones. The question came in different forms from various Germans, but the sense of concern was all the same — why are so many Americans supporting Donald Trump? I was flabbergasted. Thanks for the concern, but why do you guys care so much about what happens to us? And then it clicked. Given Germany’s history with the U.S. and the German media’s appetite for U.S. news, it made sense that the German public would be so invested in what happens to us in November. I wish we could say the same for the American public. I remember watching a ZDF newscast and the female anchor was wearing a jean shirt. I said to myself, “what on Earth is she thinking?” Well, in all probability, she probably wasn’t worrying about appealing to male audiences, looking professional but fashionable, making sure her hair was voluminous from every angle and keeping her makeup perfectly applied. Maybe she wanted to be comfortable and focus all her attention on her work. That must be so refreshing. The fact that German have to pay a “tax” for public TV networks is mind-boggling. It’s an idea that could never be sold to the American public. Even though the latest surveys show that more and more Americans do not trust the media, trust me, we all hate paying more taxes. On second thought, it would be amazing to see the model implemented in the U.S. 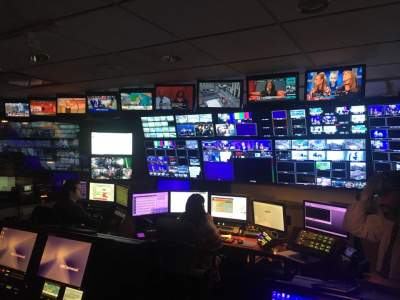 Imagine, if you will, an American newscast with less fluff, less back-and-forth yelling, less celebrity news, less sensationalism and more international news, more documentaries, more investigative pieces, more thoughtful conversations with political and business leaders? Imagine a business model that protects experienced journalists and rewards them with job security. Sounds like it would be a worthwhile investment. For now, she is the most powerful woman on the planet. Prior to this trip, I knew very little about German Chancellor Angela Merkel. After meeting Dr. Mario Voigt and speaking with Thomas Walde, ZDF’s senior Berlin correspondent who covers her, I have to admit, I really respect Merkel. She has a no-nonsense leadership style. She is not a talker, she is a doer. And in our American political system, many would agree me with me when I say, we have a lot of people who say a lot and do very little. Unfortunately, given the recent violent episodes in Germany and the growing concerns about her migrant policies (and let’s not forget, Brexit), Merkel faces an unprecedented level of pressure. Will she stay afloat? It will be interesting to see how Merkel manages the challenges ahead. Thank you so much for everything. Really. Every session, with the exception of the Axel Springer session that involved the journalism students, was interesting and useful for my journalism career. I cannot express what a pleasure it was to meet my “blind date,” Elena Kuch with NDR. It was one of the highlights of the program. Kuch was so thoughtful, friendly and open to my many questions and comments. If she lived in the states, we would be great friends! Lastly, it is one thing to skim top headlines regarding Germany, the European Union and NATO and it is another to be able to digest the news thoroughly. Thank you once again for all your hard work. Wilma Consul, National Public Radio, Washington, D.C. When I first learned that I’d be part of the RIAS Journalism Exchange Program, I felt excited just to be going somewhere. I’ve been on a similar program before, and honestly, I was afraid I would be bored and sleepy all the time especially with the time difference. But I applied because I wanted a new experience, and I wanted to learn about Berlin. For the past two years, I’ve worked as a contract producer and editor for NPR Berlin, a small radio station based in Berlin with operations at NPR in Washington, D.C., where I’m based. All the people I’ve worked with, from interns to program director, have either traveled to or lived in Berlin. They all love Berlin. The stories from our Berlin freelancers also piqued my interest about the German capital and its vibrant arts and culture scene. My work at NPR’s news programs also kept me abreast of the important issues in the region, the most pressing during our group’s stay: the migrants now living in Europe and Great Britain leaving the Union. To my delight, the RIAS Journalism Exchange Program gave me an experience worth more than status updates but rather one to remember for a lifetime. 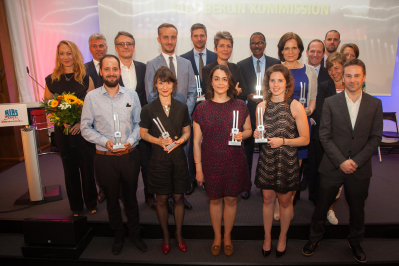 Berlin in the first week, when we met with the best of the country’s journalists, officials, thinkers and newcomers made this freelancer feel like a full-time journalist again. I felt inspired to ask many questions, not for a story but for the simple joy of learning. To witness The Wall years after its fall and from the eyes of the artist Kani Alavi put me in an out-of-a-movie state. 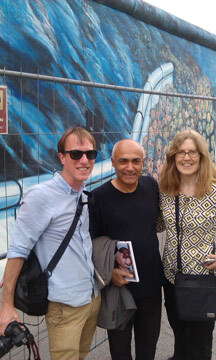 Mr. Alavi, very relaxed with a stunning artistic vision, made such an impression, I interviewed him before we left Berlin. The famous “date night” with a German journalist showed me The Wall from the border on former French sector. Carolyn Kuban of Deutschland Radio invited me to her home in Frohnau, where she still lives. It’s a 40-minute ride from Anhalter Banhof. Before a very German dinner at a restaurant packed with Euro 2016 fans, my “date” and I walked to the town church where she was born and got married. She then drove to a secluded field by the railroad tracks where a few people walked their dogs, jogged and rode their bikes. She shared her teen memories of The Wall that used to stand there, how she and her friends wondered about the people on the other side. I saw no traces of The Wall. I appreciate most the opportunity to meet refugees and hear their stories. 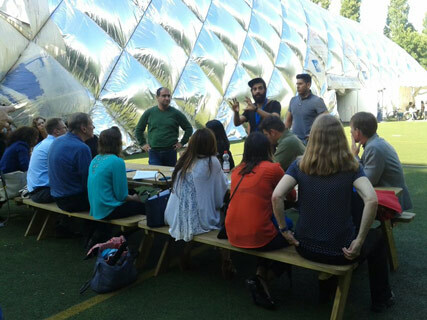 In Moabit, we were introduced to “the balloon,” the name the residents gave to their shelter, an inflated dome structure that sits on what was once a public park. Dinner with our new friends — a few refugees from Syria and several volunteers — proved to be a good time to share stories and laughs over pizza and dessert. And our visit here inspired me to do a story on the refugees in the balloon. In Erfurt, we walked a few doors down from our hotel to an organization founded by a Vietnamese woman and that works with the newly arrived from Middle East. In that short meeting, we heard the refugees’ harrowing, long and expensive journey to safety. We listened to the challenges of learning a new language, new ways, the dirty looks and hate they endure in their new home. We learned of their promising lives back home and their dreams. A refugee from Aleppo told us he ran for two days. With a fake passport, he traveled from Turkey to Algeria. Unable to fly anywhere, he rode a car to Libya, took a boat to Italy and train to Germany. His journey took one month and cost $2,000. I asked, what kept him going. “I’m only thinking about my daughter,” he replied. In quaint Erfurt, we also had the best meal of the program — a nice slice of juicy steak on top of the most celebrated vegetable of the season, white asparagus, with a sweet ending of panna cotta with fresh berries and a yellow fruit that looks like a cherry tomato with a skin cover like a tomatillo but tastes so sweet and tart and wonderful, I ate the ones on two other people’s plates. Two Germans told me the fruit’s name. But because it’s so foreign to me, I still can’t remember the name. From quaint Erfurt, we traveled to Cologne where the massive Cathedral and yogis on their mats celebrating International Yoga Day greeted us out of the train station. A walk through the bridge of padlocks led us to our meeting with Germany’s most trusted newsman, Peter Kloeppel at RTL. At breakfast of American buffet, we met two more young and talented German journalists. On the same day, we got a dose of good statistics — and great snack sandwiches — on the effects of migrants in the German labor market from Cologne Institute of Economic Research. In Brussels, it was all about the European Commission and NATO (North Atlantic Treaty Organization). Sadly, I was too sick for the EC, and got better for the NATO visit. And I’m glad I went. That day, the news of Brexit was breaking while we were inside NATO with no smart phones to get the news. But old school word of mouth spread the news to everyone one by one. And of course, I had chocolate — a lot, even before dinner, thanks to free samples. Back in Berlin, I spent my week extension reporting. This is when I learned more about the city and the people who live in it — Germans, immigrants who are German citizens, American ex-pats and the migrants. One day, I went from interviewing refugees at the balloon to talking to Asians cooking and playing bingo at Thai Park to watching ballroom dance at the Berlin Mall to sitting down with a Filipino restaurant owner in Charlottenburg. On my last day, I went outside of Berlin for the Fusion Festival to meet the special singer of a hip hop group called Microphone Mafia. She’s Ester Bejarano, one of last survivors of the Girls Orchestra of Auschwitz and who, at 92, continues to speak against racism through music. This is a meeting I will always treasure. As a first-time traveler to Deutschland, a tourist, I felt assured knowing that the public bathrooms will be clean (though sometimes you have to pay)…that women can be alone and be safe on the train or on the street late at night…that there will be good, strong coffee everywhere. My only caveat: no air conditioner at Relaxa Hotel during a very hot and humid season. But then again, the nice staff service and the warm and crusty bread that comes out of the kitchen made up for having no A/C. Thank you, Rainer, Lisa, Isabell, John and RIAS for the chance to travel, get inspired professionally and personally, and to tell stories of Germany. To the talented fellows in my group, thanks for this special time with you. The lens that I view the world with expanded greatly after my RIAS experience. This was my first time in Germany and Europe. Prior to this experience, my knowledge of Germany was limited to news, books, movies, and through German journalists who recently visited our station through the RIAS program. I was very excited to see what the other side of the program would be like, and it exceeded any expectation that I may have previously had. While traveling to Germany, news broke about the mass shooting in an Orlando gay nightclub. During my first night in Berlin, I noticed a small memorial to the victims in front of the U.S. Embassy. All week long, I watched as that memorial continued to grow with flowers, candles, and rainbow-colored American Flags. It was amazing to see such support from thousands of miles away from Orlando and the U.S. Later, I would find out just how personal this tragedy after speaking with people in the LGBTQ community in Berlin during a candlelight vigil where hundreds showed up to support one another along with those affected by the mass shooting. After turning on the television in Berlin, I was taken back by the amount of news and in-depth programs that where on television during prime time. I was amazed to see how large public media was. It was almost the exact opposite from what we experience in the U.S. Having the access to top journalists like Mr. Thomas Walde with ZDF and Mr. Peter Kloeppel of RTL was also very informative. It also gave us greater perspective into both public and private media operations in Germany. Having the opportunity to visit a refugee camp in Berlin really made it possible to better understand the refugee crisis that faces Europe. While in Berlin and Erfurt, we had the chance to listen to personal stories from refugees from Syria, Afghanistan, and Turkey gave us a closer look into what millions of people are enduring in this crisis to not only survive, but to make a better life for themselves. I have no doubt that we met with people who were adjusting well, and I can only imagine how many people at camps across Germany are struggling to get on their feet after enduring the horror that war can bring. Meeting with volunteers was really interesting as well. Thousands have answered the call to help the refugees. We were constantly reminded that the volunteers are the story that you really don’t see in the news. Traveling all across Berlin there were moments when you realized you were standing near an area where there once stood a wall that divided Germany. Visiting the panoramic art mural of “The Wall” was a very powerful experience of what it may have felt like to be in a city where a wall divided you from your family and friends. The sounds of voices of former leaders and the ambient noise of what you may hear on a regular day in a divided city were almost chilling. Visiting the East Gallery and seeing the art on remaining parts of the Berlin wall was something I will never forget. Listening to Mr. Kani Alavi, a German-Iranian painter describe his inspiration for painting his mural on a wall, which later evolved into The East Gallery and was a clear example of how art can capture a moment or a feeling during a certain time or event. Mr. Alavi was also it was involved in a movement to preserve the east gallery and also keep from not only weather, graffiti, and time, but from the development of luxury high rise apartments nearby, which already have impacted the preserved space. 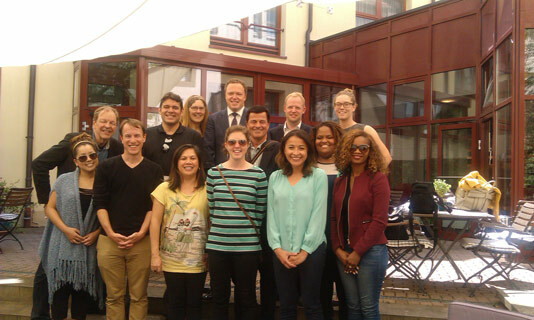 A great experience during this trip was getting to know German journalists better and making new friends. Our “blind date” night at a restaurant in Berlin was fabulous. Kathy Bradshaw and I had the opportunity to meet German journalists Michael Meyer and Daniel Haufler. It was really a wonderful dinner and an even better conversation about media, politics, and culture. It was wonderful to gain a different perspective from journalists who work in different areas of media. I feel lucky to have had this experience as well while hosting German journalist at our station. Cologne was an amazing city to see. Walking across the bridge over the Rhine River and seeing names of couples engraved on locks that hung completely across the bridge was very endearing to witness. Also, in Cologne I had a chance to catch up with German Journalist and RIAS Fellow Anna Schubert, who visited our station in 2014. We watched Germany play in the Euro 2016 at a local pub. I loved the authentic experience, and it was great to catch up with a friend as well. Traveling to Brussels was wonderful. I was amazed at the diversity and history there. 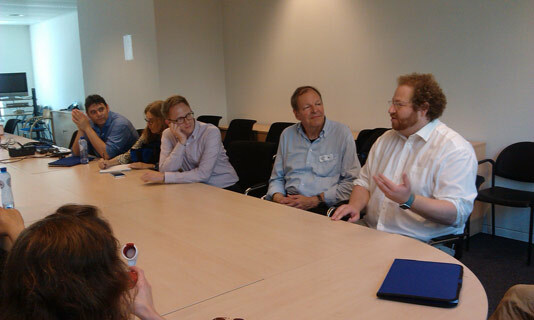 While at the European Commission we heard experts explain to us that Europe is facing solidarity crisis. With the exit of the United Kingdom and trying to figure out a plan for refugees, there was much concern. 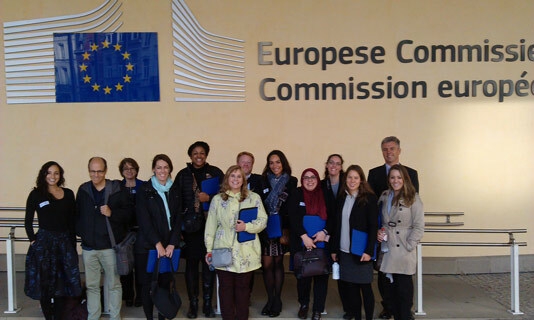 While at the European Commission we were briefed on the rise of nationalistic parties across Europe and parts of Europe. We also learned how the Commission worked. Which, I found very complex. 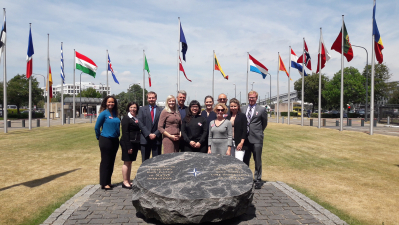 Spending the day at NATO brought opportunities to learn about the history of the organization, it’s mission, and why it is needed. We also had the opportunity to learn more about Russia, and Vladimir Putin. It was interesting to be at NATO and listen to perspectives on the United Kingdom’s exit from the European Union from policy and military experts. During our trip we were constantly asked about the rise of U.S. Republican Presidential Candidate Donald Trump and the upcoming presidential election. They offered opinions and seemed strongly concerned. After this trip and our experiences abroad I gained a stronger perspective that how important a presidential election is in the United States, and how it impacts the world. I learned how policy can divide a country or cause fear of foreigners. How that fear can built concentration camps, walls, and prisons for people with different thoughts and ideas we may have. Policy can also help people, forge alliances and strengthen a union of countries to provide opportunity for everyone and break down any walls that may have existed before. I am thankful for this life-changing experience, and I have taken this experience back to my newsroom to help strengthen our role as journalists. Amanda Scott, Voice of America, Washington, D.C.
From the beginning of this trip, I wasn’t quite sure what to expect from Germany. Interesting architecture, history and efficiency were the first thoughts to come to mind. And after spending two weeks in the country, I will admit, that those perceptions remain accurate, but there are took precedence as well. This is a theme that I often heard repeated throughout my time in the country. More than one speaker, from more than one area of expertise remarked on how Germany had the money to do things. Like the generous Godfather that springs for the restaurant bill when everyone else is digging around for change and hoping they don’t come up short. One of the most striking examples of this is the billion euro operating budget for its public media. After touring the ZDF radio studios and speaking with journalist Thomas Walde, the impression was made that no story idea, regardless of the price tag was off limits. This is, I thought, makes Germany a glorious place to tackle journalism. To be free from the constraints of budgets, or demands from ratings-obsessed means that you can provide a true window into the world for your audience. It also opens up opportunities for those entering the field, whereas many cannot afford to spend endless months interning for free while facing the weight of student loan debt. Another example of Germany’s wealth and generosity can be seen in its allowance of tens of thousands of Syrian migrants into the country. When many EU nations seemed to have quotas or outright blocked migrants from settling within their borders, Germany has gone further and actively welcomed those fleeing civil war in their homeland. The nation has repurposed buildings to make shelters, pulled in private industry’s to provide job training and hired and trained a host of people to work in newly formed registration centers. In addition the German government has spent time and resources to develop plans of actions on how best to integrate these new communities in a way that respects their culture and religion while adding value to the German society, particularly is labor market. Germany’s decision to take in a large group of Syrian migrants has dramatically changed the makeup of the nation. Although Germany has had a small community of Turkish expats, there has never been such a vast influx or peoples from one place, to the country, over such a short amount of time. From the talks we’ve had as part of this fellowship, this had not been without it challenges. As the government spreads these new arrivals across the country, smaller areas, that have been less integrated, have had to quickly adapt to new immigrants, and work to include them as part of their community. This has had its challenges. In one instance, a young woman that we’d met at a refugee center told us that while working at a clothing shop she was shoved by someone who disapproved of her Islamic headscarf. She noted instances of being followed down streets and verbally threatened. Germany is working to help its new immigrants to assimilate, through language, education and job training programs. But how to change the hearts and minds of its own countrymen remains a struggle. Unlike many country’s that seem to quickly move beyond a troubled past, Germany embraces it, head on, and uses its reflections as a reminder of the horrors mankind can inflict. In this nation, Prussian palaces are maintained along with former forced labor/concentration camps, and bits of the Berlin wall. This country holds this weight, the duty of memory, as a form of collective, conscious guilt. And one of my strongest impression that it left me with is that many of the actions Germany takes today — from supporting independent media, using its position as a word leader, absorbing large numbers of refugees — is a way to reconcile the actions of the past. A way to usher in a new memory, one to stand alongside of the old. By day seven our meetings had a certain formula to them. Our speaker would deliver his or her prepared remarks followed by some Q&A on the topic at hand, and then almost inevitably he or she would (usually at first politely) inquire about Donald Trump. The businessman’s popularity and nomination by the Republican Party was a subject of concern and befuddlement by most Europeans we met. Talking with my fellow RIAS participants and foreigners about the Trump phenomenon and the American electorate became one of the best ways of getting-to-know my peers. Our travels concluded in Brussels where our discussions on economics, populism, and immigration took a new form. By coincidence we found ourselves visiting the European Commission on June 23 — the day the United Kingdom was voting to remain or leave the European Union. A quiet anxiousness it seemed was percolating in the hallways. Dropping in on that day’s press conference, we learned that EU officials were even more masterful than most American politicians at the non-answer answer. We woke up the next morning to learn that the leave measure had passed before heading to NATO headquarters. There I received — and I say this as someone on the terrorism beat for years — one of the most frank and frankly scary off-the-record briefings of my career. Nevertheless, the message from Brussels’s institutions was obvious: Europe is stronger together and even stronger with good US-relations. Given the latest news and our own studies with RIAS, the Europe we left though seemed more fragile and with a slightly more uncertain future than the one we had arrived to just two weeks earlier. When I was accepted to be a RIAS Fellow for the summer of 2016, my first thought was, “How do I explain the Donald Trump phenomenon once I arrive?” This is something as a reporter in New Hampshire, the first in the nation primary; I struggled with while out on the campaign trail. Before Granite Staters casted their votes on February 9th, Trump led every poll, filled every stadium and as he said so many times while on the stump, “We are going to win so big” [insert Trump accent]. And he was right, Trump went on to win the New Hampshire primary in a landslide vote as well as almost every other state and caucus until he eventually claimed the Republican presidential nomination. This was something none of us American reporters could have predicted, and something we still haven’t fully wrapped our heads around till this day. And once I arrived in Germany, one of the first questions our group was asked was, “How did someone like Donald Trump become so popular?” This question popped up at every interview, meeting, tour or interaction we had with any European on the trip. Being eleven American reporters from all different parts of the nation, we all had varying theories, yes, theories because no one could quite put a finger on why Trump, someone who at a campaign rally said verbatim, “I could stand in the middle of 5th Avenue and shoot somebody and I wouldn’t lose voters,” could be just one election away from becoming the next president of the United States. Despite my anxiety of having to answer these impossible questions around Trump’s unpredictable rise, my worries soon vanished once I learned that America wasn’t the only country that had a “Trump” on their hands. In Germany, the influx of more than one million Syrian refugees last year alone spread panic among its citizens and in some cases anger and resentment. During our stay, we learned that a right wing populist group was growing in Germany, feeding off this anger. I even got a taste of this first hand during my blind date where one of the German journalists I met with rattled off these worries such as, “These Syrian refugees are terrorists, they are taking our taxpayers’ dollars, why aren’t other European countries stepping up to take in more refugees,” and this list goes on and on. Sitting there hearing these complaints, I was instantly reminded of what I heard so often from Trump as well as his supporters about illegal immigrants in America. And similar to our country, which has a President who backs immigration reform, Germany’s top official, Chancellor Angela Merkel, also supports it. And like President Barack Obama, Merkel has been deeply criticized for her open door policy, but despite the heat she’s getting lately, she has stood strong in the belief that Germany has a duty to help those fleeing war-torn countries like Syria, no matter their religion. Unfortunately for Great Britain this fear was enough to fuel voters last month when they decided to leave the European Union. Besides showcasing how the EU is a failed bureaucracy that was wasting Great Britain’s tax dollars, the major platform of the “Leave Campaign” was this: “only by leaving the EU could Britain avoid millions of refugees and migrants arriving from the Middle East.” And in a 52 percent vote, these talking points won over voters. With the U.K.’s exit plan from the EU expected to last roughly two years, the long-term impacts of this exodus is unclear, though many predict it will have devastating economic and security implications. What is clear though, is this vote demonstrates that harsh anti-immigration sentiment is not only alive and thriving in Britain, but also strong enough to drastically change the country’s future. Sadly, this capitalization of fear and xenophobia was successful for the Brexit backers in the U.K., whether this platform will be fruitful for federal candidates in Germany will play out next fall and whether it’s effective for Trump in the U.S., this upcoming fall. But what I did learn during my trip abroad is that this campaign centered on hate and fear-mongering was not just an American problem but unfortunately one that is touching many countries around the world. This is not a heartening realization, but a reality. However, like in America these campaigns may be loud, entertaining and showy but at the end of the day the majority of us will be the ones asking that same question I was repeatedly asked during my stay in Europe – “How did someone like Donald Trump [insert name of particular candidate] become so popular?” And come this November, hopefully we can all laugh and continue to wonder how someone like Trump ever came close to the Oval Office. “I was at the EU the day Britain voted to exit the European Union.” Me and 11 other fellows get to make that statement, making it part of our journalistic history, thanks to RIAS. People often ask “how was the fellowship?” my answer? “One of the most amazing experiences of my life.” Here is why. On the first day, I met some really cool people, people that are now part of my life’s story: My fellow Journalists. Everyone was unique and had a story to tell. We were all different and all had something to offer. I honestly think meeting them, building relationships and seeing the kind of journalists they are, helps my growth in Journalism. 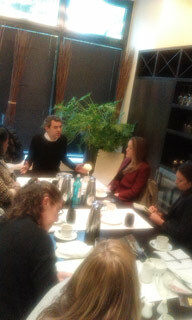 Our official meetings started with Thomas Walde, a Senior Berlin Correspondent at ZDF. Mr. Walde had a wealth of knowledge about German media and politics. Amongst many things, we learned Germany has two public TV stations (ARD and ZDR) and two private (RTL and SAT 1). The public TV’s main revenue comes from a mandatory fee that every household in Germany owning a television has to pay, about 18 Euros a month. This fee has helped stations like ZDF to have resources around the world. Being an experienced journalist, Mr. Walde had many stories to share. My favorite is the one he told of the country’s Chancellor Angela Merkel. The story left me thinking that despite her hard exterior, Mrs. Merkel is a kind and warm person. Our first day continued to be a very eventful one. After ZDF, we got the wonderful opportunity to visit a refugee emergency center and speak to some of its residents. This was one of my favorite experiences. The migrants we met changed my perspective, in fact, all of the migrants we met on the trip, changed the European migrant crisis narrative for me. They gave a human face to the story and their stories pulled on my heart strings. I’m so honored to have had the opportunity to meet a group of people who proved that despite our differences in culture, tradition, religion, etc, all of us want the same thing in life: a chance to live free , be safe, and have a peace of mind. Kudos to Germany for giving them the chance to attain this dream. our week in Berlin was very memorable. From meeting with the U.S Ambassador to Germany John Emerson, to learning about gender inequality at Axel Springer, to visiting the Bundestag, checkpoint Charlie, and the “East Side Gallery”. We got to dig deep into German politics and history — a history that the people of the country seem to be ashamed of (i.e. Berlin Wall, Nazis). Our darkest days were the days we visited a Stasi prison and a concentration camp. Though painfully horrible, I’m glad these visits were part of the fellowship. Actually standing on the grounds where thousands of people suffered brought the humanity out of me. It shook me to the core and reminded of the importance of history. Humans need to always have history on their minds so as to not to repeat it, especially the horrible one. Attending the RIAS award ceremony was an honor. Learning about RIAS history and the role it played while the Berlin wall was up made me proud to call myself a RIAS Fellow. It was also wonderful meeting and chatting with our German counterparts who shared the differences between journalism in the States and Germany. The quaint little town of Erfurt was a wonderful surprise. I had heard negative things about it so I was a bit cautious going there. I am very happy to say that my fears did not become a reality. The town and its people were very welcoming. Koln was our next destination, we got to visit RTL (private station) and talk to Germany’s favorite anchor, Peter Kloeppel. Kloeppel talked about private television in Germany and the Brand of RTL. The city of Brussels baffled me. I was surprised to hear there is so much violence (criminal and terroristic) at the place where the European Union and the NATO were headquartered. The city seemed out of place. 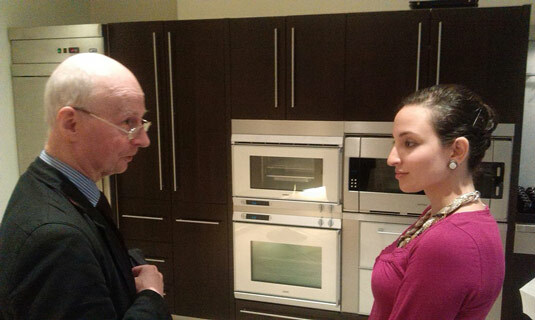 Speaking to ARD TV correspondent Christian Feld was eye opening. Hearing him tell the story of the day terrorists attacked Brussels airport and a train station minutes away from his bureau was saddening. Despite the horror surrounding them, the journalists at ARD still had to do their jobs and do it without bias. I now feel like a German expert, thanks to this fellowship. I’ve been encouraging other journalists to apply, the experience was so wonderful that I want to share it with others. Not only do you get to see Germany, learn about its history, politics, and economy, but you also get to meet people like Jon, Lisa, Isabelle, and Rainer. People that I can honestly say meeting them has made me a better person. Thank you RIAS, it’s an honor to be known as your Fellow. 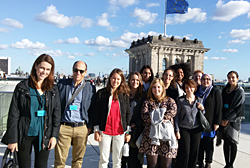 Twelve U.S. journalists are participating in the Germany fall program. 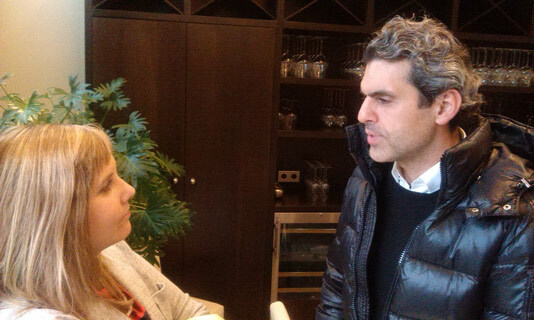 They spend the first week in Berlin for talks on current political, economic and media issues. In the second week they travel to Dresden, to Prague, and finally to Brussels for talks with the European Commission and with NATO. Individual extension program for tw. participants. The first time I visited Berlin was in September of 2015. It was the height of the refugee crisis and hundreds of thousands of refugees were crossing the borders of Germany. TV and newspaper reports were filled with stories of Germans cheering, waving and welcoming refugees into the country. People gathered in Potsdamer Platz to hold a pro-refugee rally. German Chancellor Angela Merkel called the task of handling the crisis an“historic test of Europe” and she called on Germany to lead the way for the rest of Europe as they grappled with the rapid influx of people. When I came back to Berlin in the fall of 2016 for the RIAS fellowship, the flow of refugees had subsided but the anxiety over how to handle the new population had risen. Hundreds of thousands of people are in need of homes, social services, jobs and need to learn a new language and culture. According to a June 2016 report on Flight, Political Asylum and Integration from Konrad-Adenauer-Stiftung, the issue of refugees and integration is perceived by Germans as the “country’s most pressing problem.” Many worry about how so many refugees will integrate into German society. It has exposed a dark, xenophobic attitude held by some citizens. It will be a focus of Angela Merkel’s election in 2017 and it was one of the recurring issues of our fellowship. At the start of our program we had the opportunity to meet with Mr. Benedict Göbel, the coordinator for integration policy at Konrad-Adenauer-Stiftung. He explained the efforts the German government has taken to manage the crisis. Asylum-seekers are required to take integration courses, they are assigned a place of residence for their first three years in Germany and 100,000 low-level jobs were created in an effort to help with assimilation. It is an attempt to avoid the creation of concentrated and isolated communities like that of the Turkish guest workers of the 1960s. According to Mr. Gobel’s report, more than 700 integration initiatives are “now being conducted all over Germany.” Whether or not these efforts will lead to successful integration remains to be seen. The measures taken by the Government have not been able to quell the rise of a xenophobic far right. The Alternative for Germany, or AfD, is a party built on one main issue, anti-immigration. While in Dresden we learned about the rich history of the old Saxon capital but not far from the old cathedrals and castles are the squares where the Patriotic Europeans Against the Islamisation of the West, (Pegida for short) hold a weekly rally to spew rhetoric against minorities in Germany. During our stay in Dresden the Monday rally had been canceled but it was clear from our conversations with people in the city that the issue still the divides in the country. At the heart of the issue, beyond the policy and beyond the hate, are people. For two Syrian refugees, the search for stability did not end when they arrived in Europe. In the first week of our fellowship we met with Samer and Arij. 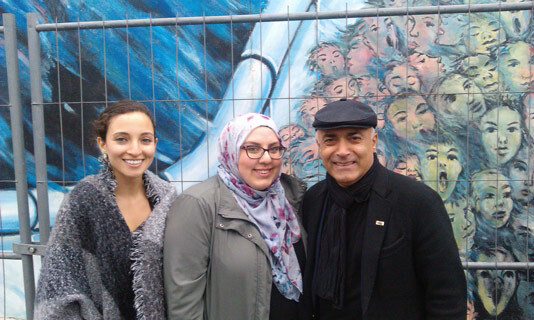 The couple came to Berlin after seeing their neighborhood bombed to rubble. They made a 30 day long trek, from Damascus to Berlin across water and borders. We met them in the Neukolln neighborhood for a tour of the city. The first stop on the tour was Shaam, a restaurant that offers the flavors, smells, sounds and comfort of the home they left in Syria. After spending 5 months in Tempelhof, the airport turned refugee camp in Berlin, Samer and Arij have found opportunities to work and begin rebuilding their lives in their new country. How Germany and Europe handle the settling of refugees will impact the world for years to come. Throughout the two weeks of the fellowship we met journalists, culture makers, government officials, academics of history and politics. The issues facing Germany today are familiar ones to us in the United States. Although we haven’t seen the same influx of refugees; anxiety over globalization and immigration have begun to change the political landscape of both countries. 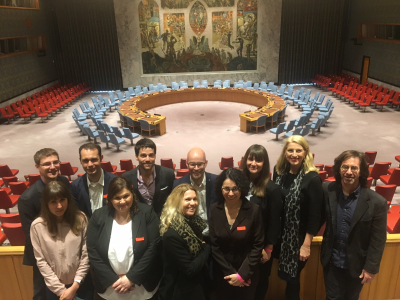 Europe has always been important in the international news cycle but it felt more important than ever as a journalist to learn about its history, people and policies firsthand. 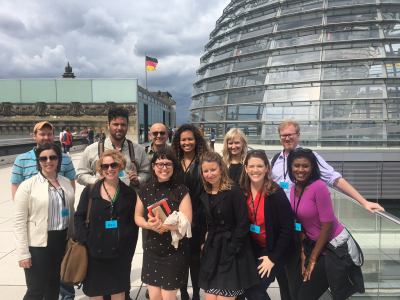 Visiting Germany with eleven other American journalists through RIAS helped me understand Germany’s central role in European politics. One particular quote that stood out in my mind during one of our meetings was “when you want to call Europe, you pick up the phone and call Angela Merkel.” Meeting with German politicians, journalists, and experts helped us really put that quote into context. I wanted to take the time to share my thoughts on certain topics after the RIAS trip. Our group was fortunate to participate in some of the celebrations marking the 26th anniversary of reunification. Berlin felt especially lively with fairs and free tours throughout the city. It’s incredible to think that just 26 years ago, things were completely different. A wall stood in the middle of Berlin, forcing many East Germans to risk their lives to flee for better opportunities in the West. There are still remnants of that divide. Germans will tell you that there is still a cultural difference between East Germans and West Germans even today. Many East German gen-Xers feel they missed out on job and education opportunities after reunification. Our visit to Dresden was nothing short of mindblowing. This is a city that was almost flattened during WWII but today flaunts stunning buildings and a rich history. Some of the destroyed buildings were rebuilt using the original stones, which helped preserve the city’s aesthetic. I must say that learning more about German history made me optimistic. As someone from the Middle east, I’ve oftentimes felt hopeless about the ongoing war and strife in the region, which seems to only get worse. Germany has bounced back from war, extreme nationalism, and deep-rooted divisions. While it’s still going through some challenges, I think that most of us can agree that it’s a positive example of a country that has overcome great odds to become one of the economic and cultural powerhouses in our modern world. During our trip to the German embassy in Prague, we learned about how East Germans camped out in the yard of the embassy to demand asylum in the west People climbed over the fence with their belongings and children. They stayed in makeshift campsites for days despite dire conditions. These were refugees trying to seek a better life in West Germany, so many of them are able to sympathize with the plight of the Syrian refugees who are now resettling in Germany. The country is going through a drastic population change as it takes in more than one-million Syrian refugees. We spent a significant amount of time talking with our RIAS visitors about what this means for the future of Germany. Germany’s plans for their refugees often seemed contradictory. When we spoke to government representatives like the Coordinator for Immigration Policy Benedict Gobel, we were told that refugees in Germany have to be integrated into German society. This means learning the German language and contributing to a quickly aging workforce. But what comes next is the trickier question. The government often tells its citizens that Syrian refugees will return “home” after the war is over, which is a notion that I and several other participants could not quite fathom. As an immigrant living in the U.S., I know firsthand that it is extremely difficult to uproot once you’ve made a life in a new country. It seems unrealistic to expect refugees to “integrate” while at the same time, tell them they’ll have to leave one day. 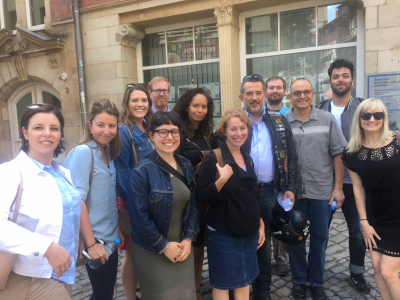 Our group took a walking tour with two Syrian refugees – a married couple named Samer and Arij, who told us about having to pay smugglers and walking tens of miles to get to Germany. The challenges continued once they arrived. Samer said he felt helpless during the times he was unable to work or do anything productive. We were told this was a common sentiment among many refugees, who want to work but feel trapped in the bureaucracy. When asked if they plan on staying in Germany, Samer and Arij seemed convinced that this is now their new home. 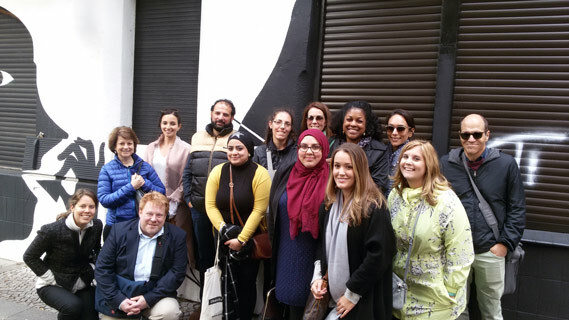 They ended the tour with a walk through so-called “Arab Street” with a line of restaurants and businesses displaying signs written in the Arabic language. Our group learned about the news media landscape in Germany and how it differs from the U.S. We toured the ARD studio in Berlin, which is one of two big publically funded television stations. Both ARD and ZDF have around $8 billion per year that is funded by every tax-paying household. One of our first questions is, of course, how does being publically funded affect your ability to cover the news objectively? According to the ARD journalists we spoke to, very little. They feel like they’re able to be as critical of the government as they want to be while at the same time, not worry as much about the click and ratings that private media tends to be obsessed with. However, public media is still susceptible to criticism — especially from populist groups who accuse them of catering to Merkel and the main parties. We also visited RTL, which is the main private station in Germany. There was immediately a clear distinction between the two studios. RTL’s newsroom felt more like a startup and their team seemed much more concerned about innovating and reaching out to a younger audience. 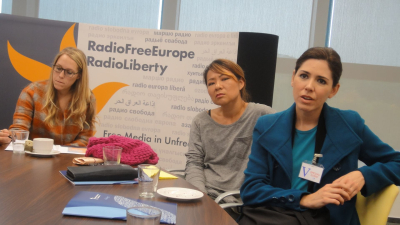 One of the most fascinating visits I had on this trip was to Radio Free Europe/Radio Liberty in Prague. As a CNN news editor, I have previously received free content from them but this is the first time I’ve actually understood who they are and what their mission is. This is a station funded by the U.S. government — mainly to provide a counter narrative to Russian propaganda in many countries. RFE/RL’s biggest goal is visibility, so sharing content with other networks, instead of competing with them, is a way to increase that visibility. Much like a public station, they are not as concerned about clicks and ratings but that doesn’t stop them from expanding and trying to innovate digitally. We spent a lot of time talking about rising populist movements in Germany and Europe, particularly the AFD party and PEGIDA. While in Dresden, we had planned on attending one of PEGIDA’s demonstrations, which take place every Monday but it happened to be cancelled on the day we were there. Most of the Germans we spoke to are very well-informed about U.S. politics and could see similarities between the political climates in both nations. Very few Germans tend to take the AFD seriously, much like they didn’t take Donald Trump seriously. In writing this after the U.S. election, I’m certain that most Germans are shocked at the decision to elect Donald Trump as president but perhaps it’s forcing them to take a second look at their own populist movements. I know that I will definitely be watching the next German elections closely. There is no greater learning experience for a journalist than stepping outside of one’s comfort zone. 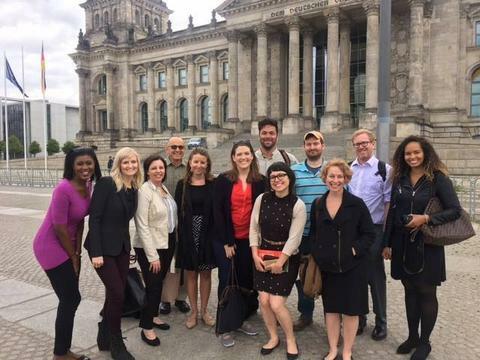 The RIAS program forces fellows to do just that, exposing American journalists to new issues and challenging preconceived notions about Germany and the European Union. I found every topic fascinating, but took special interest in Germany’s handling of the refugee crisis. I was surprised to find the challenges with refugee resettlement in Germany are similar to those in the U.S.
More than one million people fled their countries to seek asylum in Germany last year. Most of the refugees arrived with no knowledge of the German language and skills that won’t make it easy to find work. Germany has a specific integration process that allows refugees to work toward permanent residency after meeting several benchmarks over a period of three to five years. In contrast, America took in just 85,000 refugees during the last fiscal year. President Obama wants to increase that number to 110,000 refugees in fiscal year 2017. While that’s only a small portion compared to what many European countries are dealing with, America faces many of the same challenges with integration. Many Syrian refugees coming to the U.S. are highly educated but don’t have a strong command of English, making employment problematic. And, similar to the sentiments of the AfD and Pegida movements in Germany, some Americans are opposed to welcoming refugees. The speakers that focused on the refugee crisis helped widen my global perspective of the situation. Going on a walking tour with two refugees and learning about the challenges they’re facing in Germany was especially interesting. Many of the Syrian refugees coming to Indiana are afraid to speak to the media because of Governor Mike Pence’s opposition to their resettlement in the state. Hearing a first-hand account of what the Syrian couple went through to make it to Berlin will provide valuable context for future reporting I do on the migration of refugees. But the most valuable aspect of the program is not professional, but personal. Traveling through Europe and learning more about the history and current affairs of Germany awakened my hunger for learning. The fellowship made me reflect on my career, goals and views of the world. I left feeling inspired and reinvigorated, wanting to continue learning more about international relations. I’m now considering going to graduate school to focus on European studies, something I had no plans of doing before the trip. It was an important reminder that even local newsrooms should be telling stories within a global context. The RIAS program was nothing short of life changing. I am extremely grateful the opportunity to participate in the RIAS journalist exchange program in Germany, Prague and Brussels. The experience opened my eyes to the political and social issues facing Germany and Europe that often get buried in the news headlines and 24-hour cable news coverage in America. The RIAS program provided a clearer picture about the ongoing refugee crisis and its impact on Germany and its political leadership. Listening to German journalists speak candidly about the challenges facing refugees coming to Germany was both fascinating and startling. Our discussions with representatives from various government agencies revealed how much of a bureaucratic nightmare the refugee crisis has become for Germany, yet the majority of voters still support Chancellor Angela Merkel’s policy decision to welcome close to one million refugees in 2015. 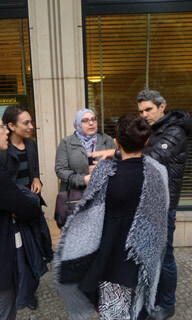 Our walking tour with two Syrian refugees, a married couple, in Berlin gave me a much better sense of just how desperate the situation is for so many people and their children. It is hard to even imagine the amount of sacrifice families must face to decide to leave a war torn country in seek of a better life. Listening to Samir and his wife gave me a better understanding of what is at stake. Our visits to ARD and RTL television news studios were quite interesting and highlighted the differences and similarities between German and American public and commercial news outlets. RTL’s newly launched television program targeting millennials through a more visually appealing and interactive format is a strong similarity between both Germany and the U.S. are facing the same demands when it comes to attracting younger viewers to generate broadcast and digital advertising revenue. However, overall German news seems to be way less sensational and infotainment driven than American news networks. I would have to admit Germans are by and large more educated about American history, politics and foreign policies than many Americans. I found the German journalists we met during the program to be very forthright and direct about how they approach journalism and news coverage. There is a clear difference between how Germany and U.S. cable networks cover political candidates during presidential campaigns. As we heard at RTL, German broadcasters would be reluctant to air a candidate’s campaign event without interruption for an extended period of time, compared to American news outlets. When it comes to newsgathering and reporting on social and political issues, there are similarities to German vs. America approach to reporting, focusing heavily on humanizing stories and using solution based case studies to generate informative content and compelling storytelling. One of the most eye opening moments for me during our RIAS program happened during our visit to the Germany Embassy in Prague. It was heartbreaking to watch the ARD TV news documentary about the desperate measures East Berliners were faced with in order to seek asylum at the Embassy. I was deeply moved to watch how thousands of people from the GDR risked everything, living in extremely harsh conditions outside the Embassy, for a chance at a better life in West Germany. Looking back, I really wish I had a better sense of what was going on in the world back in 1989, when I was 13 years old. Fast forward to our current digital age where everyone around us is consumed by the latest technology and accessing information on mobile devices it was refreshing to notice many Germans are not nearly as distracted by technology as Americans. I feel the same could be said for many European countries. At several restaurants in Berlin and Dresden I observed Germans aren’t as glued to their smart phones the way many Americans are during social gatherings and while dining out. I still smile about the Austrian restaurant I ate at in Berlin’s Kreuzberg neighborhood where the sign posted outside the restaurant reminded customers there was no WIFI access for customers and suggested people should talk to each other. What a concept J and a good reminder for all of us to stay connected and embrace each other. My first memory of current events as a child was the fall of the Berlin Wall. I remember sitting with my parents in our kitchen watching thousands of people break through concrete bricks to embrace loved ones on the other side. I didn’t quite fully understand the significance of the moment, it just made me happy to see people cheer and dance. Participating in the RIAS program has allowed me to understand more fully the consequences and complexities of that day and how the end of the Cold War still reverberates throughout German political and cultural life. While we learn a lot in American history classes about the ‘special relationship’ with Britain, the bond we share with Germany is just as strong and strategically important to our future success. Germans take a lot of pride (but not inappropriately too much!) in their system of government and their social programs. Yes, the public transportation is — as Donald Trump would say — bigly impressive and their investment in public media was mind blowing to this American reporter. Germans really do possess an aptitude for efficiency and I felt that I connected to their sense of order—and their love of dogs. But my immediate and lasting impression of the German people was their sense of history and devotion to turn the burdensome darkness of the past into a shining example of leadership for all of Europe and the world to emulate. I got to see one of the last remaining portions of the wall I had only seen on news reports as a kid when our group visited the East Side Gallery. Kani Alavi (founder and artist) described to us the atmosphere of that night in November 1989 as he witnessed the scene from his apartment window at Checkpoint Charlie. Kani said he expected to see many happy faces, but instead saw a lot of faces filled with fear. With the fall of the wall came much hope, but also insecurity about what would come next. In a sense, this same fear and insecurity still lingers in Germany as the country deals with the refugee crisis, a faltering European Union, and the rise of populism across the continent. One of our speakers — Thomas Habicht — illustrated this dichotomy in his remarks by pointing out that Germany has never been so prosperous, and yet so uncertain about the future. The refugee crisis encapsulates both the highs and the lows in Germany right now and was a major topic of focus during our program. Germany showed a lot of courage in welcoming Syrian refugees, but the country was unprepared for the amount of people that came and the fear of others (some legitimate and some not) has brought out a dark nationalist streak in various pockets of the country. This situation provided one of the most memorable experiences of the trip — a walking tour of Berlin with Syrian refugees Samer Serawan and Arij Oudeh. Samer and Arij are a husband and wife team that worked as lawyers in Damascus before fleeing the country. Samer told us that his decision to leave Syria came after he miraculously survived a bombing that leveled their home. Samer and Arij were sent to the Tempelhof refugee processing center for five months before being placed in an apartment closer to town. I was grateful to hear Samer’s story — there has been a lot of fearmongering and misinformation in the U.S. press about refugees and being able to speak and engage with Samer and Arij helped put their plight in perspective. At the time of our tour, Samer was still unable to find more permanent work. He is doing the tour as a way to make himself useful and show gratitude to the country that offered him protection while he learns the language and navigates the bureaucratic process. Samer’s experience reflects some of the common frustrations of the integration process. German officials that spoke to our program stressed the importance of integrating refugees into the workforce and keeping them long-term, but were quick to point out they expected refugees to go home once Syria becomes more stable. Of course, not everyone is happy about the refugees. Dagmar Pepping, a former RIAS Fellow and journalist with the public station ARD, explained that the refugee crisis (along with the Euro crisis) had caused fresh skepticism of the German government. While constantly questioning the government is a favorite pastime of Americans, it seems Germans have had their confidence shaken in the ability of the system to work and function as it is designed (remember, German efficiency!). The infamous Cologne attacks on New Year’s Eve and Chancellor Angela Merkel’s admission of not knowing who came through the border has added fuel to the idea that the media and government elites are hiding information from German citizens. As one of my libertarian contacts remarked to me, the problem with Germany is “that everything works.” Seeing cracks in the system has cultivated a feeling of distrust which has translated into support for nationalist populist movements like Pegida and the Alternative for Deutschland (AfD) political party. Germany’s effort to make sense of this populist movement gives me comfort that we as Americans aren’t alone in navigating this nationalist wave. The election of Donald Trump will be a disruptor to the political system (depending on your views that can be a good or a bad thing) and many countries across Europe are facing similar political choices. My hope is that the success of both the Brexit and Trump campaigns will push Germany to confront the populist sentiment in their own backyard and begin a dialogue with their citizens about their legitimate concerns without condescension (a mistake some made in our media back home). Douglas Johnson, Voice of America, Washington, D.C.
Germany and the government of Angela Merkel continue to reel from the challenges of the Syrian refugee crisis. Vladimir Putin’s Kremlin steps up its multi-pronged assault on the institutions of Western democracy. Voters in Great Britain vote to leave the EU, calling into question the entire European experiment. And the globe struggles to understand who Donald Trump is, and how his presidency stands to possibly reshape the world. It’s hard to remember a moment in time, certainly in my life, when so many major, unpredictable, and potentially damaging pressures were coming to a head. But that’s the time I was lucky enough to accept a RIAS fellowship in the fall of 2016. The two short weeks of meetings in Berlin, Dresden, Prague and Brussels were almost of a singular theme: the internal and external threats facing Germany and the European Union, and what can be done in response. While such a moment makes politicians nervous, it makes for a great time to be a journalist. The RIAS staff arranged for a variety of speakers and presentations, no doubt to convey the full sweep of contemporary German and EU politics. But invariably the discussions turned back to these central issues almost organically. The caliber of the speakers was stellar, and their frankness with our group was refreshing – no doubt due in part to our agreements that all discussions were strictly off-the-record. There is no doubt that every one of us left the experience with heightened awareness and new perspectives as we cover this historic moment for the continent. 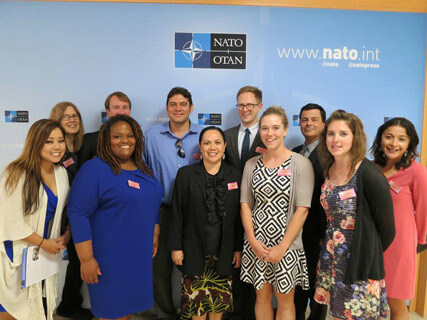 Kaitlin Lavinder, The Cipher Brief, Washington, D.C.
A dozen American journalists — from California to Minnesota to New York and the nation’s capital — approached NATO Headquarters in Brussels, Belgium. The city recently made headlines for a terror attack on its airport (and indeed, armed military personnel were roaming the terminals when the journalists landed). 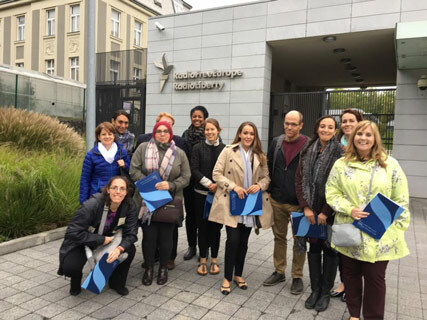 Brussels was the final stop of a two-week long fellowship with RIAS, or Radio in the American Sector — a product of the aftermath of WWII and the Cold War. Ms. Allison Hart, Executive Director of NATO’s Public Diplomacy Division, greeted the journalists in a standard conference room. In a well-rehearsed talk and with the demeanor of a seasoned briefer, Ms. Hart announced, NATO was founded “to safeguard freedom and security.” The statement rang in my ears as a summary of the entire trip — to Berlin, Dresden, Prague, and Brussels. 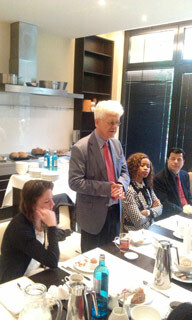 Yet with freedom comes responsibility and risk, explained Thomas Habicht during a RIAS breakfast talk in Berlin. Habicht, the Berlin columnist for der shz-Zeitungen, continued, saying for the East Germans, that meant economic, political, sociological, cultural, and psychological risks to suddenly having to ‘integrate’ into an entirely different form of governance. Granted, many East Germans were more than willing to take on these risks (and likely did not view them as ‘risks’ per se). At the German Embassy in Prague, RIAS Fellows watched a documentary on the flood of East Germans storming the embassy, in search of asylum in West Germany, just days before the Berlin Wall was announced null and void. You could feel the emotion in the room — in fact, the RIAS Fellows were sitting in part of the embassy that was used to house the refugees as their faces flashed across the television screen up front. Risk has a second meaning, though. That is, the national security risk that comes as a price of freedom. As Germany again formed a unified nation in the heart of Europe, the country’s statesmen had to remain hyper vigilant of its neighbors’ perceptions. Henry Kissinger once said – and Mr. Habicht repeated to the RIAS Fellows — that as the biggest power in Europe, both in terms of economics and population, Germany will always be encircled by states that will make allies with one another, against Germany, if the European project fails. Thus, Germany’s newfound ‘freedom’ post-reunification heightened risks to its national security, entrenching the country in the EU. The press attaché at the German Embassy in Prague, Dr. Guido Müntel, noted that Germany believes in the need to reestablish support for the European project, including support for coordinated internal and external security. Given Germany’s history with state abuse of intelligence and security services and the German role in WWII, Germans for the past 70 years have been reluctant to engage in the security versus freedom debate, with the latter inherently taking precedence. However, as the terror atrocities targeting the European continent this summer illustrated, freedom is impossible without security. These and other recent events, like Russia’s annexation of Crimea, have shifted the security versus freedom debate into a more rational zone, Dr. Karl-Heinz Kamp told me. Dr. Kamp, who is the president of Germany’s Federal Academy for Security Policy (BAKS) and who I met with during a RIAS-supported work extension in Berlin, explained that more public acceptance of the need for security is allowing the government to pursue different models of national protection. One of those models includes a stronger and more productive role in NATO. As the RIAS Fellows learned in Brussels — by far the most insightful part of the trip, in my opinion — Germany is leading a Framework Nations Grouping. That means it is working with a number of other NATO countries to pool/share resources and capabilities, with the potential to engage in mergence in certain areas; Germany is leading the biggest installation of this effort. 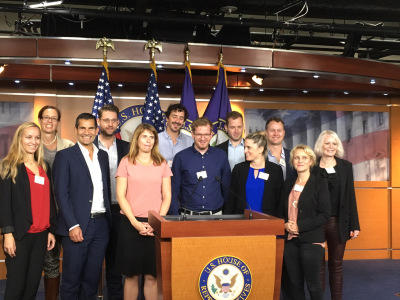 From Berlin to Prague to Brussels, RIAS Fellows engaged with journalists, politicos, citizens, and one another, learning that Germany and Europe have a rich history and support a highly developed form of democracy, that is, utmost freedom for the people. But with freedom comes security challenges. Germany is taking a lead in Europe in addressing these challenges head on. 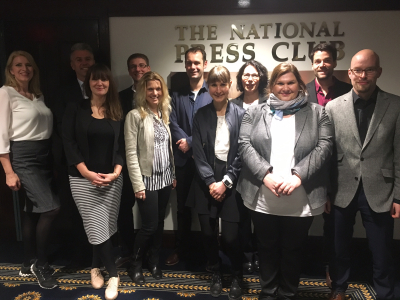 I returned to the United States from the fall 2016 RIAS German/American Journalists Exchange Program a better consumer and producer of news. The intense and thought-provoking program achieved its goal of helping this American journalist to think bigger and enabled me to more clearly communicate global issues to an audience. From day one, our schedule was packed with fascinating lectures and discussions about German politics, history, economic policy and culture. From our first “breakfast meeting” in Berlin with Mr. Benedict Göbel, coordinator for integration policy at the Konrad Adenauer Foundation, who explained German refugee policy, to our tour of Volkswagen’s modern transparent factory in Dresden, not a moment was wasted. A theme that resonated throughout our two weeks was the plight of Syrian asylum-seekers in Germany. Once welcomed by most of the population, Syrian refugees are now facing backlash from populist political parties that are steadily gaining momentum. The parallel to what is happening stateside provided fodder for hours of substantive discussions among our diverse group of 12 journalists from across the country. 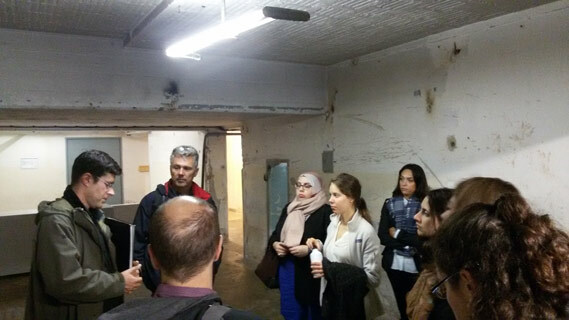 A walking tour through the Neukölln neighborhood in Berlin with tour guides Samer Serawan and Arij Oudeh, a married couple who fled the violence in Damascus, was particularly impactful. The couple made the difficult decision to leave their home and spent 30 treacherous days travelling from Damascus to Turkey to Greece and finally the Balkan Road which led them to Germany. As they walked us through Neukölln, a borough known for its large Middle Eastern population, Samer and Arij described the time they spent in the infamous Templehof refugee camp. Conditions at Tempelhof, an abandoned airfield in Berlin, were hard. There were no showers, lights were on 24 hours a day and the asylum seekers packed into the space were not allowed to seek work. After 5 months they were moved to another location where they share a small, but private, apartment. Samir and Arij, both lawyers, had comfortable lives in Syria. The decision to leave didn’t come easily, but after a bomb destroyed a building close to their home and Samir’s car was stolen at gunpoint they decided the risk was worth it. Another meeting that left a lasting impression happened hundreds of miles away from Berlin at the German Embassy in Prague. On an appropriately drizzly, gray day Dr. Guido Muntel, press attaché for the embassy, took us back to the fall of 1989 when more than 4,000 East German refugees camped out on the embassy grounds before finally being taken to West Germany, marking the end of the repressive East German regime. Dr. Muntel showed a riveting documentary showing desperate East Germans scaling the embassy fence, and spending cold nights outside, as conditions worsened and embassy employees struggled to provide food and shelter. The juxtaposition of two different refugee experiences was powerful and drove home the idea that refugees, no matter their skin color or religion are all looking for a safe place to call home. 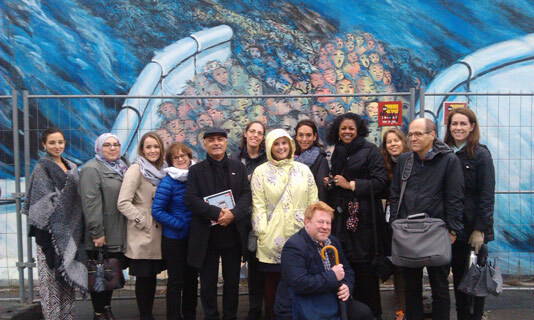 There were many other powerful experiences on our trip, including a guided tour of the East Side Gallery with German-Iranian artist Kani Alavi, a tour of the Reichstag, and off the record briefings at the European Commission and NATO. Not to mention the free time we had in the evenings to explore on our own and get to know the other program participants. The RIAS Germany Program was incredible and I heartily thank organizers Rainer, Erik, Lisa and Isabell for their hard work and hospitality. How is Donald Trump doing so well? What’s going to happen in November? Over the course of two weeks, from speaker after speaker, my fellow American journalists and I would hear those questions. At first, the other question made me roll my eyes. You KNOW how Trump happens, I wanted to say. Read your history books. You saw it happen. But in some ways, that was the point of the question — how is Donald Trump doing so well when the world, and especially Germany, has already seen the mostly logical endgame of what happens when a man like Trump takes power? The answer emerged over two weeks spent in Europe — the world is really, REALLY bad at learning from history, even when so much of current life is defined by history. Our first day in Germany was German Unity Day — the celebration of the Berlin Wall falling and the emergence of the new German Republic. But even 27 years later, experts told us, much of the unity is in name only. There are still huge economic and cultural divides between the former German Democratic Republic and the former Federal Republic of Germany — to the point that people of a certain age will still mention if they are from East Berlin or West Berlin. The fact that the divide still exists really shouldn’t surprise anyone. After all, the Civil War ended in the United States more than 150 years ago, but the divisions between north and south remain as stark as ever. There’s also the divide between the hustle and bustle of the cities where tech and service economies dominate in contrast to the old industrial centers of the “Rust Belt.” That was a key divide in the 2016 presidential election. And it shouldn’t surprise anyone that there are politicians who look to capitalize on these divides wherever they exist. There are Trumps everywhere — literally. And I worry that in much the same way the chattering classes in the United States completely missed what fueled the rise of Donald Trump, something similar is happening in Europe. In Germany, for example, many of the experts told us Alternatives for Germany is a one-issue party made relevant again by its opposition to the uncontrolled migration of the last year. With the migration crisis under control, the argument goes, AFD’s very reason for existence will eventually vanish. I’m not convinced. Germany’s track record of integration is spotty, although the country has managed to avoid creating a Molenbeek, and the “solution” to the migrant crisis is to a patchwork of agreements that depend on the will of other countries to live up to them — which is definitely not a given. And what happens if discontent with the migration crisis leads to the broader discontent that fueled the rise of Trump? The bottom line? Germany, and the rest of Europe, would do well to not miss the lessons of their past and the present of the United States. You can’t afford to ignore the appeal of a right-wing populism to a discontented population, no matter the source of the discontent. It is true that the economic situation in the United States is not as objectively bad as it was in 1920s Germany, but the most important thing to a voter is how they feel about the economy, not what measures like nationwide unemployment might say. But there’s also a lot that the United States could take away from present-day Germany. For one, government investment isn’t a bad idea. The class gap isn’t as large as it is in the United States. The quality of your educational opportunities doesn’t vary immensely depending on where you live. Higher education is virtually free. Mass transit is clean, runs frequently and on time, and goes where you want and need it to go. Additionally, U.S. citizens would do well to be even half as informed as their counterparts in Germany. I didn’t get a chance to test the theory, but I would be willing to bet that the average Joe on the street in Germany knew much more about the 2016 election than the average Joe on the street in the United States. And the media, especially television news, could stand to take a good look at the way their German counterparts do business. It doesn’t have to all be about the latest gruesome crime that happened halfway across the country, or the latest celebrity gossip, or the latest “exclusive” that’s only an exclusive because you were the only reporter in the room at the time. There is room for a sober-minded exploration of the issues — something that in this new world order will only become more important. If you had asked before I left on the RIAS fellowship, I would have said (somewhat smugly) that I had a pretty good grasp of German history and the current state of the nation. After all, I’ve visited several times — including a three-week visit five years ago — and can manage to get around with my stumbling language skills. Turns out, my understanding was much shallower than I realized. Since I’ve returned from the fellowship, not a day goes by that I’m not struck by how much this trip changed my understanding of world news. It has not only changed how I understand the news from Germany, but how I think about stories out of Italy, Greece, France, Russia and Syria. That thinking is informed by people we talked to, stories we heard, and information people shared. It has even impacted my understanding of U.S. news, as we look at how Russia — via WikiLeaks or otherwise — may have had a powerful influence in the presidential election. I decided to go to Berlin a day early, and what a wonderful accident that was. Being there for Reunification Day made it particularly poignant to tour exhibits on the Wall, a panorama of 1980s Germany, and a pop up multimedia history of the wall, all before our program even began. I was impressed over and over again at the commitment the German people have made to not forget their history and the tragic lessons learned. To see not only museums on the impact of World War II and Stasi, but to see the availability of the related records is a powerful statement that Germany, at least, won’t make the same mistakes again. Once the fellowship began, we took in a huge amount of information from journalists, politicians, academics and other Germans met along the way. There were so many highlights of the two weeks that if I tried to list them, it would end up being a recitation of the schedule, but there were a couple things that I find myself thinking about often. 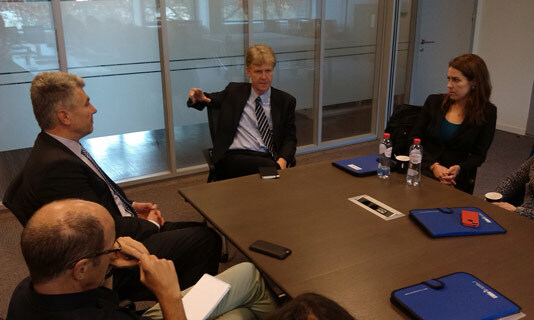 The off-the-record meeting with John Emerson, the U.S. ambassador to Germany was fascinating. The trip to the German embassy in Prague was an incredible history lesson. The discussions with NATO analysts about relationships with Russia and the Middle East immigration have stuck with me. Our fellowship broadly focused on immigration and refugee issues, but touched on so many more things — Russia’s European influence, far-right movements, the state of the EU. In addition to the concrete issues, it also got me thinking about more theoretical things — the nature of citizenship, how refugees integrate into new countries, and our personal obligation to help in world crises. 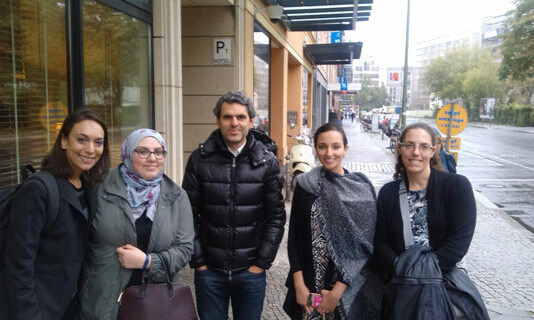 The Syrian refugee couple who gave a walking tour of their Berlin lingers in my mind for their eagerness to help us understand the situation there, for their resourcefulness in leading tours and for the barriers they face, even in a largely welcoming Germany. On “blind date night,” I was struck by how similar we are as journalists. And at other times, I was struck by the differences in our cultures. One of the lessons that Germans took from the past large immigration of the Turks was that a common language is a critical component to integration. Now, to get a job, you must have a level of fluency in German. We’ve made very different choice in the U.S. While I understand the reasoning behind the German thinking, coming from a nation of immigrants, I believe that language is only one piece of integration. I can’t forget to mention my fellow travelers. They each brought interesting perspectives from their own parts of the country and their own backgrounds that added even more to the entire experience. And because I’m a better photojournalist than I am a writer, I thought I would include a few of my favorite images below as part of my essay. I can’t think of any other two weeks of my life that have been as influential in how I look at the world. I can’t thank you enough for that. 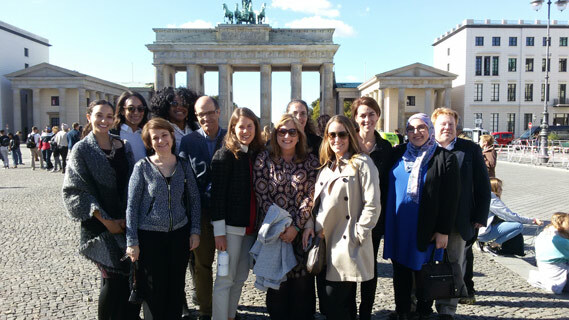 My journey to Germany from the U.S. for the RIAS fellowship was more than just a continental flight from one first-world nation to another. I expected to learn a few things, meet some interesting people, see some cool places, sample Wiener schnitzel and enjoy a cold Deutschland brew. Add a few foreign cities to the notches on my belt of travel stops and have some fun along the way. I accomplished all of those things, but I also encountered something I didn’t expect. My voyage turned into one of more personal growth than a geographic or cultural experience, and it has made be a better journalist. Having switched career paths from business to journalism just a few short years ago, my reporter skills in some ways are still in their infancy. I’m wide-eyed and curious — eager to soak up everything I can about current world affairs and the history that helped shape our current global landscape. I traded in spreadsheets and PowerPoints for a microphone and a notebook. In many ways my grasp of bygone world issues needed some dusting off — a far off memory from my high school history classes. I’ll admit there was a touch of anxiety filling me as I boarded my flight from Detroit to Berlin. I was familiar with news of the thousands of refugees filling up Germany, and the perception that a terrorist attack somewhere in Europe was almost nearly imminent. Who could forget the recent attacks in France? But all of that anxiety quickly dissipated once I arrived. I landed in Berlin the evening before the program was set to begin and was greeted at my hotel by the inimitable Rainer Hasters, longtime RIAS program director. His thick German accent, warm smile and gentle giant presence welcomed me with open arms, immediately putting me at ease. That night I explored the area around Kreuzberg and was struck by how safe I felt walking around as a young woman after dark. It was Unification Day, so several shops were closed but many people were out and about. I stopped at a nearby hotel restaurant for a cup of goulash and an apple streusel — two German culinary delights I highly recommend! The meetings officially started the following day and I met the eleven others with whom I’d share my time with over the next fourteen days. Each of them bright, accomplished, cultured and excited to be there. Together we learned from German journalists about the scars of the Hitler era, the wounds still healing from the Berlin wall and the refugee crisis currently occupying the minds of German citizens and elected officials. Perhaps the most profound experience for me during those two weeks was actually meeting two of those refugees. A couple in what appeared to be in their mid-thirties from Damascus, Syria took us on a tour of the area of Berlin where many Syrian and Turkish immigrants reside. They both defied the image in my mind for Syrian refugees. I ignorantly pictured people with meager means, broken English if any and limited educational background, but the two refugees I encountered were quite the opposite. In fact, when I showed a picture of me along with the other RIAS Fellows and the Syrians to my friends back in the states, few could tell me who pictured among us were the refugees. The husband, a former businessman and sales manager, the wife a lawyer — both spoke near perfect English. They were highly educated and even funny at times — but their journey from Syria to Germany was anything but a laughing matter. Using a portable microphone, the husband told us how the couple finally decided to leave Damascus after a bomb nearly wiped them out. He said it was a sign from God that they were still alive, so they decided it was time to leave. Forced to travel by a boat stuffed with other refugees — far more people than the boat was designed to carry — through the rough waters from the Syrian border to Greece — these two were the definition of survival. And they are the lucky ones. They told us in order to even get that far refugees needed $5,000 or more each — just to get past the border “police” who charged them to get out of the country and into Europe. Next, they made the month-long journey from Greece to Germany to seek refuge from their beloved yet war-torn country after Chancellor Angela Merkel opened its doors to them and thousands of others. Once they finally arrived in Berlin, the couple said they lived in a large convention center type building near the airport — filled with hundreds of other refugees. They expressed their gratitude to the government for allowing them in, but also shared the difficulty of occupying space with so many other refugees — their belongings stacked near their individual makeshift cots. They couldn’t leave for fear those belongings would be stolen. Could not work. Could do nothing but wait. For months. They told us the German government provides them with a small stipend, but little opportunity for work. Throughout the hour or so long tour — a job that was created for them through a German nonprofit — the couple introduced us to their music, language and food. I was profoundly touched by their story and humbled by their resolve despite all they had been through. These people were not terrorists or threats to society. They aren’t trying to mooch off of the German government — they don’t even want to be there. They love their country and the many family members they left behind. Both of them said if not for the war they would go home in a minute. The harsh reality of a brutal civil war forced them to flee, leave their professional jobs behind for menial ones and encounter extreme hardship just to stay alive. Yet this version of their story was rarely featured on the front page of any newspapers or the lead in the nightly news. Throughout my remaining days in Germany I had the opportunity to meet the U.S. Ambassador to Germany and learn how ill-prepared the country was to handle this massive influx of refugees. In some ways it also seemed like the German leadership was in denial about how long the refugees would stay. There seemed to be little plan to acclimate them to Germany society. Rather the strategy is to simply provide a place for them to hang out in the meantime while Syria battles out its civil war. The point of this recollection isn’t to criticize Germany or its policies, rather it’s more an exercise of analyzing a serious issue that until my experience with the RIAS program I was uneducated about. It helped me gain a perspective from the immigrants who’ve come to America that we were ill-prepared to handle years ago — to identify with their struggles and now better tell their stories. For example, there is a large Hungarian population outside Toledo, Ohio — the market I serve as a broadcast journalist — many sought refuge here after the Hungarian revolution in the 1950’s. Shortly after I returned from my trip to Germany, these immigrants were celebrating the 50th anniversary of their journey to the U.S. — they shared the same kind of struggles I heard from the Syrians in Berlin. 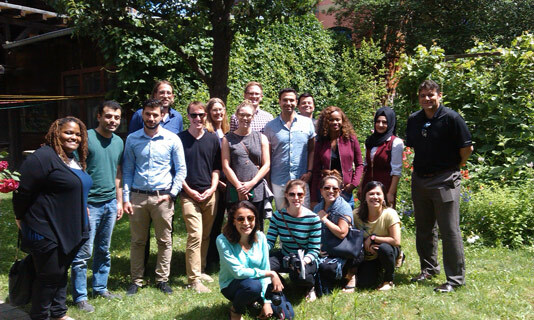 The encounter with the Syrian refugees is just one example — there were many other experiences during my trip to Berlin with the RIAS Fellows that left me better-informed, challenged my pre-conceived notions and broadened my cultural horizons. Plain and simple, because of RIAS I’m a better journalist and overall global citizen — and I’m deeply grateful I was chosen as a fellow. Best of all, I made some friendships and memories that will last a lifetime. Our trip took place in early October, a month before the elections in the United States. Everywhere we went, be it a TV studio in Berlin or NATO headquarters in Brussels, people asked us what we thought was going to happen and whether Donald Trump could win (and I for one was mostly wrong in my predictions). It was a reminder of how interconnected the world is and how much the US shares culturally and politically with Europe. The flow of information went both ways. When we visited a Berlin neighborhood that was home to refugees, or heard about a rightwing party gaining power in the east of Germany, or listened to an EU official discussing the threat of Russian propaganda, it threw the issues facing the US into stark relief. It’s not just that we face a lot of the same challenges, though we do. There are forces at work that cross national borders and it’s not clear our governmental systems are up to dealing with them. At least that’s what I thought in my darker moments. We spent much of our time in Berlin and Dresden, so it is not surprising that much of what I learned was about the issues facing Germany. I admire the way Germany has embraced the darker parts of its history, how it holds them up as a lesson to the world and to itself about what can go wrong when a country falls prey to its worst instincts and loses sight of democratic values. Other countries can close their doors to refugees. Most Germans seem to feel that they don’t have that luxury and that they must hold themselves to a higher moral standard. It has the money, after all, at least compared with much of the rest of Europe. At least that is the way it seemed to me as an outsider. I have traveled a fair amount and I’ve found that one takes distinct moments away from trips. On this trip, I experienced several that will stay with me a long time. We heard from a man who works for a German party think tank about the massive task Germany faces resettling a million refugees. For most of his talk he drily and objectively described the steps being taken and how the government views the job ahead. Then near the end he was asked about the schools. He couldn’t help himself. He had a friend who was a teacher, he told us. It’s a disaster. On another day, when the weather was cold and blustery, we took a walking tour of a Berlin neighborhood where a lot of refugees from Syria, Afghanistan and northern Africa lived. Our guides were a husband and wife who had fled Syria a few months before, making a dangerous journey through Greece and Turkey to reach Germany. They gave us cards with Arabic writing and asked us to match it to signs on storefronts. It was a game with a serious, even desperate, purpose. They wanted us to understand what it’s like to pick up stakes and flee to a strange place where nothing is familiar, and to think about how bad it must have been back home to make so many people embark on such a journey. It was an effort to create empathy and for most of us I think it worked. In Prague, we visited the German embassy, a former Baroque palace that seems to embody layers of European history all by itself. Thousands of people from the east camped out during the waning days of the Cold War, in 1989, hoping to get passage to the west. As tumultuous as it was then, it is a pretty quiet and tranquil place today. All that remains from that time are holes in the plaster where bunk beds were set up to give East German refugees a place to sleep while they awaited visas. Our trip contained many moments like that, when history reared up and confronted us in strange ways, and the past and the present briefly crossed paths. There was the visit to the Bundestag, where our guide tried (without success, on my part) to make us understand how members of parliament are elected. But then came the reminder of what is at stake for Germany and why it takes elections so seriously: We were shown walls covered by graffiti written by Soviet soldiers in the early days of the Occupation, now preserved as history. Still, I came away feeling less confident about Germany. I was used to thinking of united Germany as a success story and its strong economy a testament to the resilience and strength of western values. Instead I heard about the lingering resentments and disappointments of people in the east, who had high (perhaps too-high) expectations about what their lives would be like post-unification. Likewise, the growing strength of the AFD party seemed to worry and concern a lot of people we heard from. On the other hand, one other thing I learned was that Germans tend to be a bit more pessimistic than Americans. So maybe the future is not quite as dire as they made it seem.